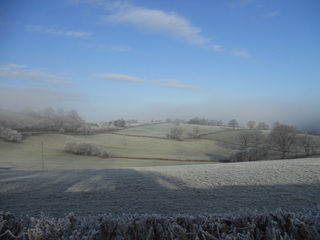 House sitting in Cotswolds or Wales? A while ago I subscribed to a website which advertises housesits. 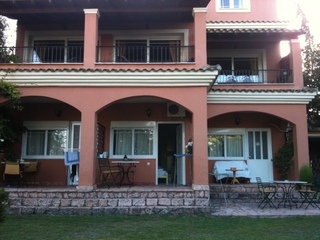 Every now and then I visited the site and spent a pleasurable moment viewing house sitting opportunities in various countries. There were so many options to choose from. During the Christmas holidays, for instance, there are lots of choices. However most of them are for shorter periods of time, varying from only a couple of days to two to three weeks. Although it would have been fairly easy to find a housesit then, I was going home for Xmas. 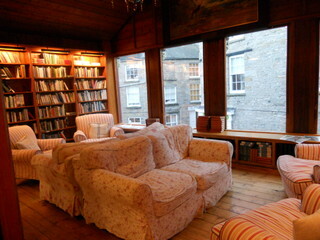 At some point I suddenly noticed a little line on the website saying: looking for a longer housesit? Somehow I had overlooked that section up till now. Upon clicking it I found a few longer term options. 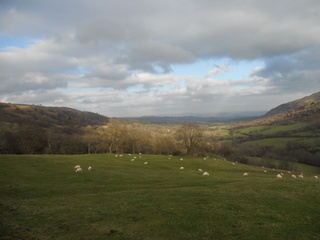 One was a two month housesit in the Cotswolds, another was a two month housesit in Wales, near Hay on Wye. Both started around the 19th of January 2015. It was just before Xmas when I dropped them both a line. The very next day I got an email back from the Hay housesit. Edward and Laura were looking for someone to sit at theirs while they were off to see family in Australia. They needed a pet sitter for their cat and collie. They had never used a house sitter before and were a little nervous about the concept. They asked me to visit them so we could get acquainted and see if we were right for each other. The next day I got an email from the Cotswold housesit asking whether I had a phone number they could call me and when they rang we also got along great. This lady was looking for someone to take care of her elderly cat while she was off to South Africa. 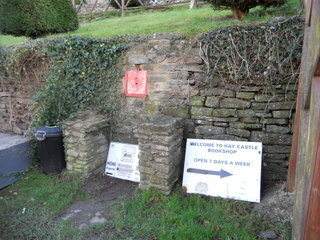 I told her I would first go meet the people near Hay because they had contacted me first. 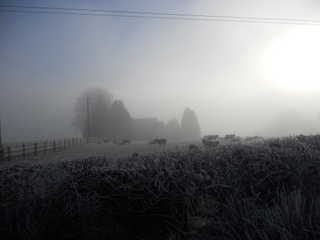 So one Sunday morning I drove up to Wales and met Edward, Laura, their cat Minnie and collie Jock. I immediately fell for Jock. He reminded me of my own dog which I got in France years ago. Whereas my dog had been a mixture of nature turned out looking like a collie, Jock was a true one, slender and fit. I had missed having a dog all these years so I took an instant liking for him. Minnie was a beautiful tortoise shell cat. 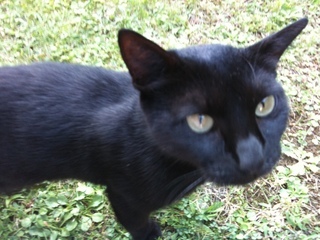 Like any cat she was self contained, friendly when she felt like it, very much independent with fur as soft as silk. Edward and Laura seemed to want no further ado: they liked the look of me and happily offered me the housesit. They had only heard of the website one day before my response to their ad. And they were astonished at the rapidity with which they had found a house/pet sitter. They had been looking for a person in their own village and among their friends, but found no one willing. The one person who was offering to take the dog was found unsuitable because they lived in an apartment on the second floor. Edward and Laura were chuffed to bits with the website. So now all I needed to do was inform the lady in the Cotswolds that unfortunately I had obligations elsewhere and that was that. Now I had an agreement to housesit from the 19th of January to the 19th of March. 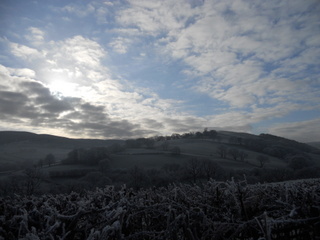 Perfect opportunity for writing and painting and walking miles in the lovely Welsh countryside with a wonderful dog. I was pleased as punch. I had done some housesitting before. In the Netherlands I had sit with a cat. Very nice. A cat is obviously easy. They are independent, you don’t have to walk them and so you have lots of time for yourself. Another sit I had done in the south of France. That was not so much a sit as an elderly lady wanted someone to help her out with clearing out stuff which she had accumulated over the years. We had spoken on the phone and she was friendly enough. She said I could stay as long as I liked if we got on well. Sounded good. However it turned out to be not a succes at all. The lady had issues. She was very wealthy having built a fortune in America. She owned houses and apartments in 7 countries, yet she was lonely and not very fit. She was also very suspicious and worried that people wanted to take advantage of her and the first thing she said upon collecting me at the bus station in Cannes was: ‘We agreed you would not get payment, correct?’ Even before saying hello! I set her mind at ease and we drove to the house. 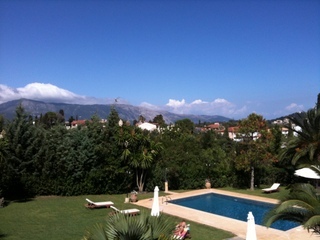 It was not in Cannes but very near it in an even more luxurious seaside village. 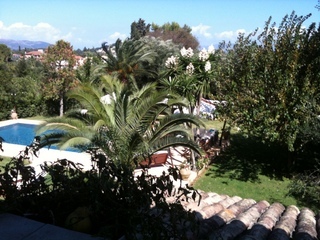 Her house was absolutely magnificent overlooking the Mediterranean and of course there was a pool in the garden. She asked me to help her with watering the plants, clearing out her stuff and keeping her company. She would provide food and lodging. 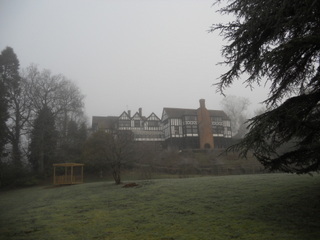 The lodging was an independent studio in the garden. I was to live there, it was small but had a kitchen and a bathroom. She said, upon arriving, ‘The little studio needs cleaning first, and I thought you might want to do it yourself the way you like it, so you cannot live there right now. You will get a room in the house for the time being. The room she gave me was fine. It had an entire wall which was a wardrobe which was closed with padlocks. One day she needed something in there and she showed me what was inside: five meters of wardrobe filled with designer clothes, shoes and handbags! It was worth a fortune. She said: ‘I keep it padlocked because you never know what temptation may do to people’. I thought this a very rude remark, but kept silent. To say the studio was untidy was the understatement of the century. In truth it was stacked with stuff or rather it was bursting with it. Besides it was plain filthy the kitchen and bathrobe seemed to have been used for years without cleaning. The whole place needed thorough clearing out and cleaning. I soon became aware of the issues of the lady: she did not want to throw anything away. She turned out to be a hoarder. She said: ‘O no, better not part with that, it may come in handy one day. Better hang on to that, I don’t like to throw good stuff away’. But in fact she did not even want me to throw out empty cartons, empty washing liquid bottles, plastic bags, thrash. It was awful, she hang on to everything. Then she had a wardrobe in the studio which she opened and which was filled with stuff. She said that it would be good to take everything out and stack it elsewhere. Then she needed to see to some issue with the poolmanager. In the meantime I decided to shut the doors of the wardrobe, I would ask her what to do with the content later. But reader, as soon as I pushed the doors the entire wardrobe came apart and fell over me. The door hit the huge old television set which then fell on my leg. I was trying to hold the wardrobe back, because I was afraid to get crushed under it and also did not want to let it fall because all the content of crockery and whatnot would get broken. So I screamed as hard as I could for help. ‘Au Secours! Au Secours!’ I yelled. But they were at the pool and could not hear me. One of the doors gave way and fell on my leg. I was nearly at the point of giving up, because it was way too heavy. Imagine one of those huge wooden French cupboard! Luckily just at that moment the pool guy ran in and pushed the wardrobe back. I fell on the floor and cried my eyes out. My leg was throbbing. I feared it was broken. The old lady said: ‘That was not my fault, you cannot sue me.’ I was appalled she should say such a thing at that moment. She clearly was devoid of any feelings and in this American frame of mind where everyone tries to get rich by suing others. She did not even come to look at the leg. I could not walk so the poolman helped me to my room. My leg was in a sorry state, blood was running full length and it was terribly bruised. The poolman said: we had better go to the hospital, I will take you. However the old lady did not want me to go. She eyed me suspiciously. I told them I would try to clean the leg first and would decide afterwards. I wanted to be left alone. I felt so awful. Fortunately I had Arnica pills with me and Calendula spray to clean the wounds. The swelling and the bruises were really bad, but I figured no doctor could do anything about it. It needed healing. I decided I would wait and give it a little time first. The next two days I could not walk. I hopped around a little and did not do any cleaning. I was surprised to find the old lady never once asked me how my leg was nor how I felt. She did not show any solicitude nor concern. Let alone feelings of guilt. Furthermore, whenever I was in the kitchen of her house with her she commented om my cooking. She herself ate very unhealthily, huge pieces of meat and chicken with chips or crisps on a plate in front of the telly. I am an non-meat eater and so I usually made some salad. It was the end of June and the weather was lovely. The lady did nothing but commenting on everything. ‘I can see how you are so slim, you eat nothing but rabbit food.’ She had bought some lovely cherries which she ate all by herself not sharing any of them with me. 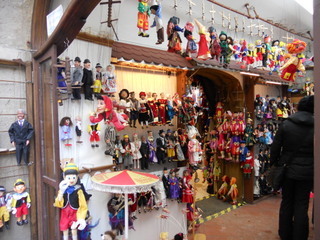 She said: I paid those four euros so please do not touch them. Yet she was clearly a millionaire. It was the time when Francois Hollande was about to win the elections. She was in front of the telly watching the political developments closely, all the while cursing the socialists and saying she would have to think about a strategy because if that man got chosen he would impose a tax on large fortunes and she would have to pay 40% tax on this her second house and her apartments in Cannes and Nice. She was horrified by the idea. I told her that surely it would not hit her too hard since apparently she seemed wealthy enough, but she said how could I, ordinary person, understand anything about money. Since she was 70 I never commented on her rude remarks. However it became very clear to me that we were not going to get on. I considered that I had taken on this house/company sit for fun, and until now I had had zero fun. Instead I was being insulted and treated in a way I would never ever treat a person. As she kept saying negative things about me even after I sat down with her and told her she should be a little more respectful, I told her I would leave. I booked a cheap hotel in Cannes and told her I would ask the gardener to give me a lift. But this she did not want. I think she was afraid of what I might say to him. First she tried to make me stay by saying she apologised. Saying she was planning on taking me to Italy for the day and so on. I did not fall into that trap, it was all words. I left. I went to the hotel. The manager asked me if I needed a doctor since I was still not walking properly. I told him I would see how I would feel after a good nights sleep. The old lady drove off in her expensive car. I felt sorry for her. She was lonely and rich. She had heart problems and her children did not want anything to do with her. How is all that money ever going to make up for that? Another house sit was in an apartment in Brussels. It was a peculiar type in the sense that I was to be a counsellor to the owner a couple of hours a day. 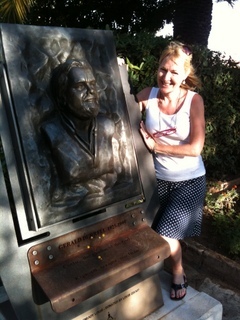 In exchange for board and lodging I was his private counsellor. 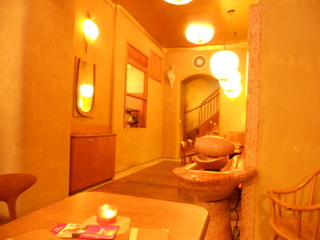 It was a very nice arrangement. As a trained counsellor and coach this was a nice arrangement and the apartment I stayed in had just been refurbished so it was brand-new. Overlooking a nice little park in a lovely area of Brussels. Three weeks in the apartment was simply lovely. No pets to take care of this time. Brussels is a lovely city and I enjoyed working on an illustration project there. House sitting is to me a very nice way of discovering areas while not having to bother about hotels. If there is any truth in the existence of an after life, then logically it follows there must also be truth in the existence of former lives. I can’t rule both out. It sounds actually rather plausible to me, specifically since I cannot account in any other way for the wonderful, yet peculiar, sense of homecoming I get as soon as I set foot on British soil. I simply love being in the UK. The entire island that is, no restrictions whatsoever to just England. The other day I read on someone’s blog that they preferred being sorry for things they’d tried, rather than being sorry for things they did not do in their lives. Boy, could I relate to that. My worst regret is having missed out on a year in a London college in my early twenties. I studied in France at the time and had the opportunity to attend college in London for a year. Due to circumstances I did not go at the very last minute. I try to not think too often about it, because it still makes me feel sick to the stomach to have made such a stupid mistake. And now, some 25 years later, I am visiting London several times because my nearly 21 year old daughter has the intention of studying in London and needs to go for interviews at Uni. (and before you wonder: no, I have never urged her to opt for London, she can choose Paris, Milan, New York, for all I care, but she chooses London. No complaints from me though…). I come to the UK as often as I possibly can, but only rarely go to London, so these occasions to unite the practical with the enjoyable are very welcome to me. Since we had to come a few times, and since London is not the cheapest of places to stay, I browsed the internet for places which were affordable. I decided what the heck and be a daredevil so browsed the Couchsurfing website and was lucky to be invited to stay at the home of a very lovely lady. She turned out to have a daughter the same age as mine, so we stayed the night at hers. We all got along fine. A lovely experience. For free! Amazing? I suppose it does sound amazing. Truth is that in this world based on money and economy, there is a growing stream of people who are fed up with this system and who are looking for true sharing. Thus our first couchsurfing experience became a success. We only stayed one night because we did were flying home the next day, but still it was a nice way of doing it and definitely something to do more often. The week after we flew back to London, unfortunately I was not able to find another couch for two at so short notice, and our wonderful host had already other couchsurfers staying, so we booked a hotel. It bore the odd name of ‘Accomodation London Bridge’. Turned out to be good value and considering that one spends but little time at the hotel when in London, an adequate place to stay. There is no restaurant, so no breakfast, nor a bar, but a pub around corner. The room was fine. Albeit quite small, it was simply spotless. The cleanliness of the room, the bathroom with nice bath and shower, tea and coffee making facilities, and not too far a walk from the underground made this a good place to stay. We stayed for 3 nights. The staff was very very friendly and helpful. So if you do not require a huge suite, it may be a place for you, if your budget is tight. I really don’t mind that there was no breakfast at the hotel, it gave us the occasion to try out nice places for breakfast in London. It’s quite hard to actually say that a place is the best, because it all depends on what you are looking for and on your taste. My daughter and I have a few requirements which satisfies our ‘definite go’ demands. 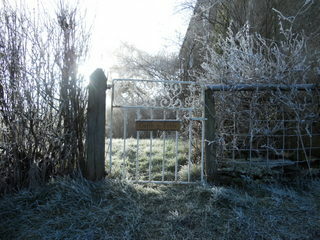 First of all the ambiance must be welcoming, nice, homely, cosy. It’s hard to find the correct term in English since in Dutch there is a word which covers all of the above in one word namely ‘gezellig‘, which does not translate in any other language that I know. Maybe you get the point when looking at the examples of our choice below. 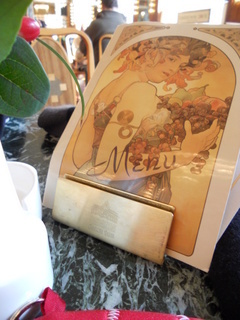 What we want is somewhere where you can sit cosily, enjoy not only good food, but healthy food. Where you get a decent cup of tea. 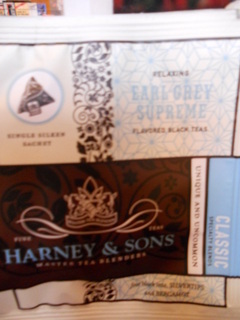 Not just black but also green tea. We like the following places. 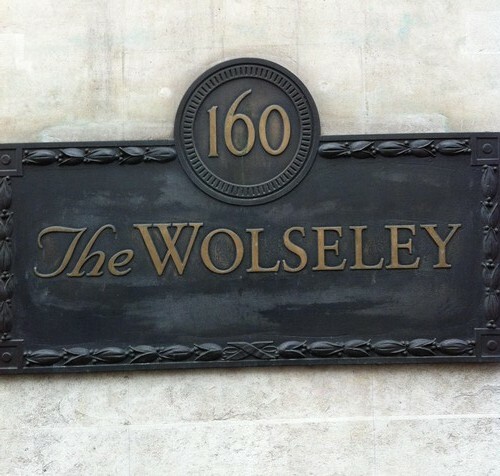 The Wolseley is a grand café-restaurant located right next to the Ritz on Piccadilly. Sorry for the quality of that picture to the right below. 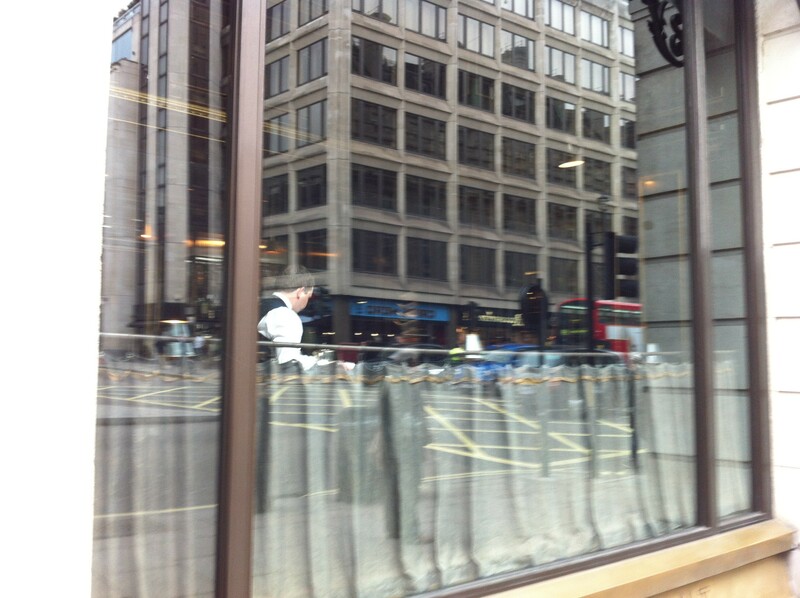 You can still see the waiter. We were sat in the seats of the bar. Very nice. The reflection of the buildings opposite was non intended. My daughter is an absolute health freak and at the same time has a sweet tooth. 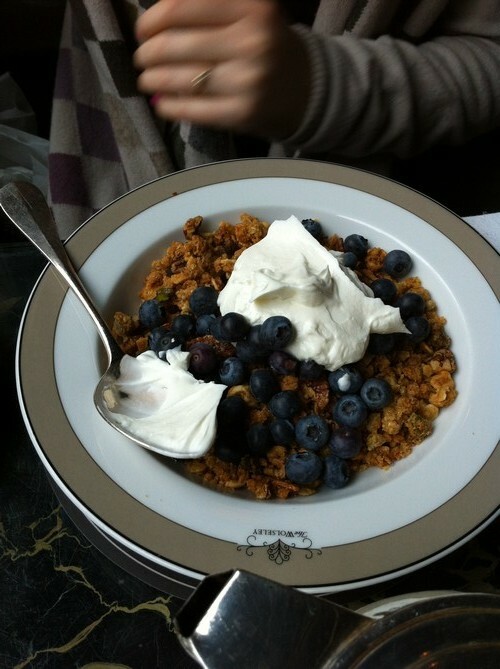 Upon her compliments about the granola, the waiter explained the chef at the Wolseley prepares their own. That accounts for the great taste. Wonderful nuts and simply a treat to start your day with. We also ordered toast and porridge. Typically English you might think. However for Vata dosha, porridge is a good start of the day and soothing for the system. 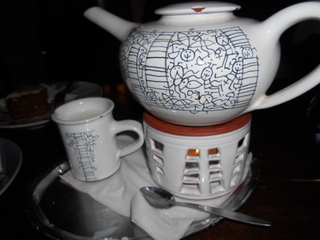 The tea comes in silver teapots and the strainer is simply a cutie! 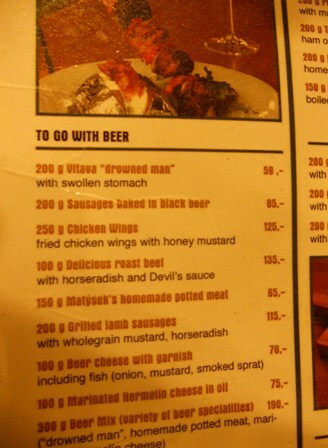 I asked the waiter where I could get one. He gave me a flyer of the Wolseley and informed me there is a website from which one can place orders for teapots and tea and also the strainer. I looked it up. Price of the strainer is 70 pound. Photo below comes from their website. 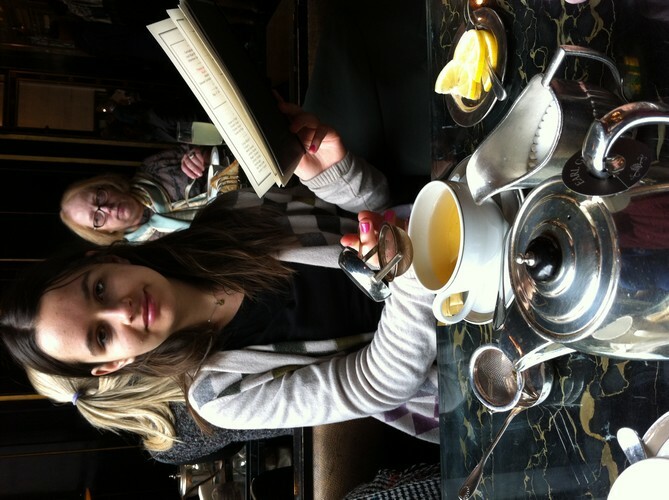 We had breakfast twice in ten days at the Wolseley. Besides breakfast one can have lunch or dinner. Or indulge in a fabulous afternoon tea. Be sure to book a table in advance. It’s a very popular place. We did not book for breakfast but the waiter told us, booking is needed for afternoon tea. 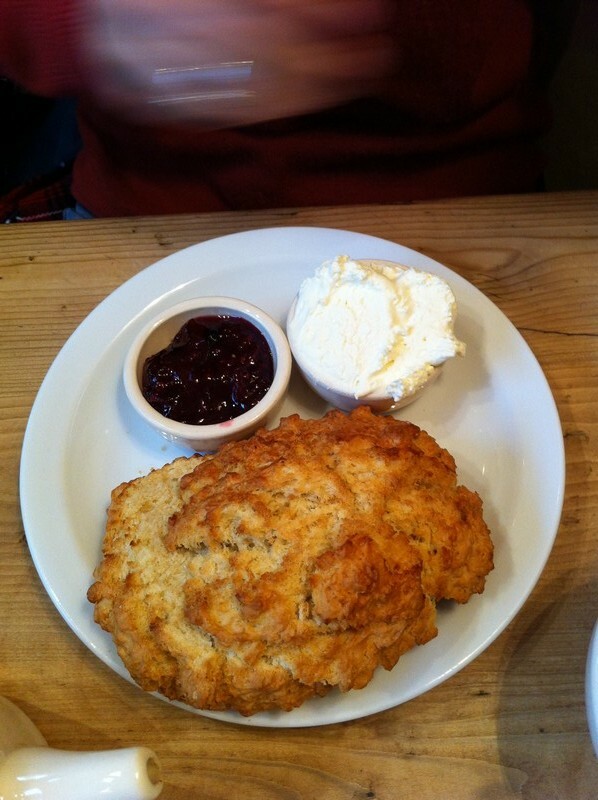 As we found out later Le Pain Quotidien is a chain of restaurants which is located in many places in London. 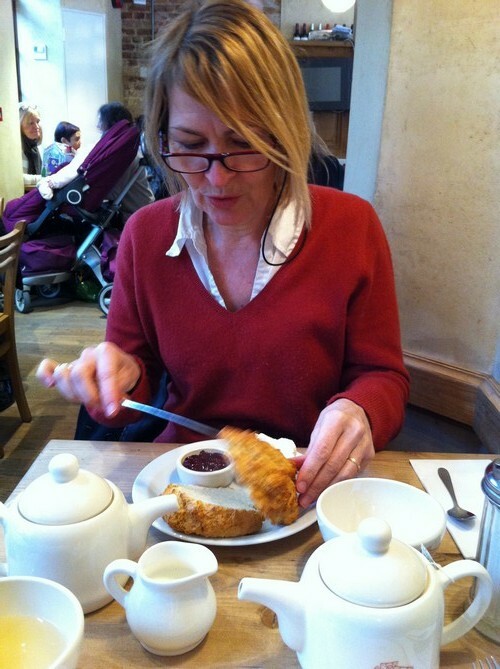 We actually had breakfast in the one located near Borough Market (15 Winchester Walk, Blows Yard SE19AG), lunch at the one at St Pancras station, and tea at the one in covent Garden. 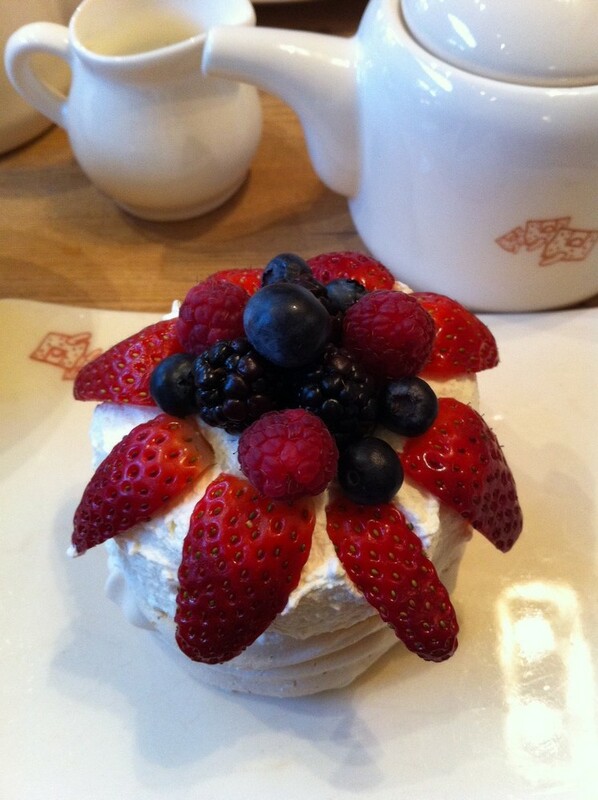 Their food comes from the same bakery, so whichever you try, the food is good in any. Staff was friendly. 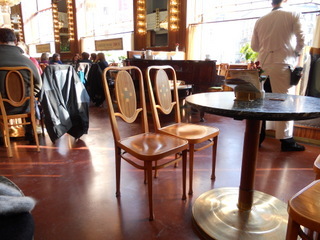 So a nice place to get a decent breakfast. Another place we like is Jamie’s Italian in Westfield. We are a fan of Jamie’s because he is a nice guy and we have got 4 of his cookbooks at home. The food we usually order is great. One of us was a little disappointed with his pasta, which contained hardly any fish and was dry-ish. When he told the waiter, this nice man was willing to go get something else to satisfy this customer, but that was not needed. Nice staff. Mostly nice food. The only thing we recommend is Jamie add some brown bread on the menu. Paris is a city I know quite well. As a young woman I studied at Sorbonne University. I used to love living in Paris, felt as if I was on a perpetual holiday. 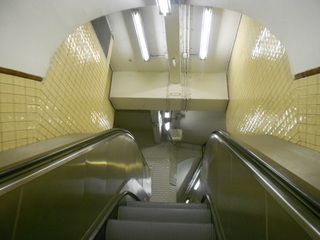 Even the peculiar smell of the Parisian underground did not bother me. Over the years I have returned to Paris many times. I used to run courses there, travelling to Paris on the Friday returning on the Monday. Such lovely memories. 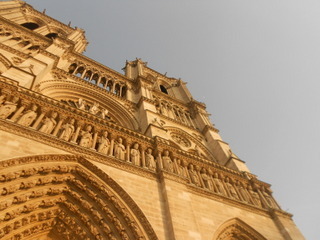 It has been a while since I was in Paris last, maybe as much as two years or even a bit longer. A friend who recently came to visit brought a book by Sempé, one of my favourite illustrators. His drawings are such a delight. He is very famous in France and quite well-known even abroad, particularly in America because he has done many covers for the New Yorker magazine. Anyway, my friend told me that currently there was an exhibition of Sempé’s art on in Paris. 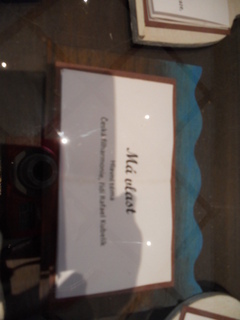 He also said this exhibition was ending on the 31st of March. I immediately arranged to go to Paris. And so there I was, on a train, nothing could stop me. I simply have to see this exhibition. 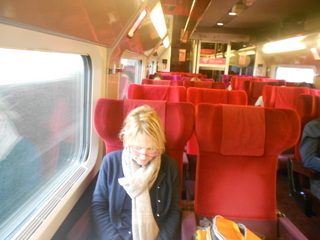 From Amsterdam, travelling to Paris is best done by train. No long waits at the airport and no hassle having to leave your toiletries home because of strict security regulations. 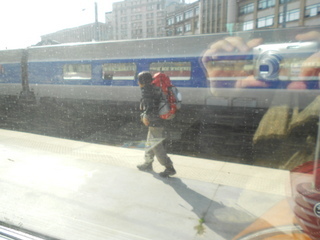 Besides with Thalys it’s only 4,5 hours away. Since I do quite a bit of air travel, travelling by rail is a nice change. There is a special feel to it. But then I do like travelling in general. Once I’m settled in my chair, be it in an aircraft, or a train, there is this sense of letting go. You definitely cannot go anywhere, so you just allow yourself to relax where you are and indulge in reading, napping and in my case: writing. Also in a train you see far more than in an aircraft. Besides scenery outside, people are forever walking by, going to the bar, to the loo or just for a walk. Take just now for instance. This elderly couple, grey haired and by the looks of their clothing quite well off, just came back from the restaurant carriage. The lady carefully walks by. I can see her looking intently at the numbers above the seats. She moves determinedly towards her seat. Her husband however stops a few rows back from mine. He looks at his wife wearily. Shaking his head he calls her name. She simply walked right past their seats. He smiles almost in a fatherly way. She quickly turns round and walks back up to him, smiling apologetically. There is an underlying sense of compassionateness to this couple. A lovely thing to spot. I feel quite content already and my journey has only just begun. Another couple caught my eye. This couple had to be about 65ish. They entered the train at The Hague and were both carrying quite heavy rucksacks. 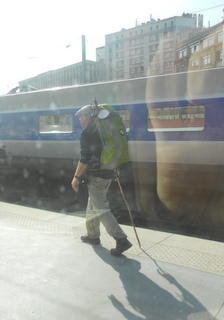 They carried walking sticks and on the gentleman’s rucksack was a sticker of St Jacques pilgrimage in a prominent position. Obviously this couple were on their way to doing a walk. No need to be a detective here. I supposed they were on the Saint Jacques de Compostella trail, but I could not be sure. However what I intend to do is go and have a chat with them at some point. Since I am planning on doing a long distance walk for the very first time in my life this coming summer, who can give me better tips than those who are accustomed to walking. Dyed in the wool walkers so to speak. Although I am quite determined to go and ask them, I get a little doubtful a few hours later. Maybe they will take it as prying. Just as I am debating in my mind whether I should go and talk to them or not, the gentleman passes by. He’s off to the toilet. This is my chance. I follow him and await him in the corridor outside the loo. Not exactly the nicest of places on a train, but I wanted to chat to him and not have other passengers listen in on us. So there I was. 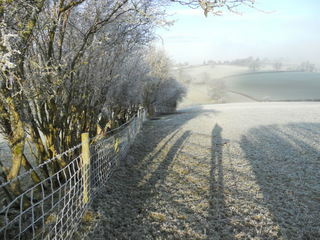 The gentleman came out, I asked him would he mind if I were to enquire about his intended walk and he said not at all. Indeed they were on their way to finish off the Santiago de Compostella pilgrimage. They had started it ten years ago at Pieterburen in the Netherlands. A hint of pride rang in his voice as he told me loads of pensioners say they are ‘doing Compostella’, but actually they only walk the last part from the Pyrenées to Compostella in Spain. Not them though. They did part of the pilgrimage every year and were now off to finish it. They intended to do the final 800 kilometers in approximately 7 weeks. I asked him if he could give a starting walker like myself any hints or tips. His creed was: ‘Anything you leave home is a bonus’ (alas the pun is lost in the translation from Dutch). No more than 3 sets of clothing, food, a light weight sleeping bag for colder areas, (maybe just a sleeping sheet for France where it’s quite warm), some Teva sandals for the evenings. And some first aid kit for insects bites or blister band aids. I asked him if walking sticks were recommended. He said they both used sticks. He explained that two walking sticks was not his thing. It gave him a restless feel (reminded him too much of Nordic Walking, which is a sport that has gained some popularity in Holland over the past years, mainly with people who want to lose weight). However, just for the tougher climbing parts he did carry a second stick which was folded away until needed in his backpack. Sleeping they did at pilgrims hostels. He said they could be quite cheap ranging anywhere between 5 to 10 Euro a night. He also told me to check out a website www.santiago.nl. Which I obviously did upon coming home. On that site I found for this particular pilgrimage you can get a pilgrims passport which is handy because among other things it allows you to sleep cheap in hostels. I thanked Mister Walker profusely and wished him a wonderful finish. He wished me luck on my first camino to come. Upon arrival in Paris, him and his wife were the first to get off the train. I simply had to take their pictures and so forgive me for the quality, they were taken through the window. See the big rucksacks they are carrying? They must be quite heavy. Mr Walker told me that each time they arrive at a hostel they wash some clothing. That’s why they are using special lightweight and quick drying stuff. The sun awaited us in Paris. Quite a relief. Holland was dreary, after a period of lovely sunny weather, the cold had returned and clouds turned everything to grey. Not so in Paris. 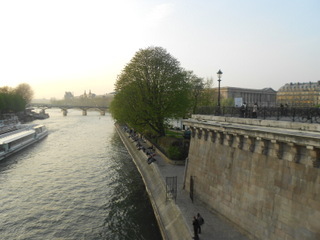 Know that song, ‘I love Paris in the Spring time..’ Well I agree. 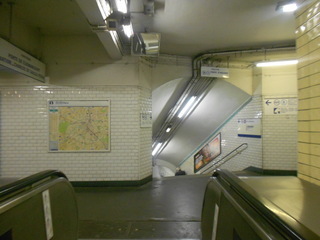 We headed for the RER, the underground in Paris is the fastest way to get anywhere you want. 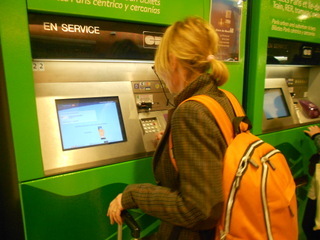 We bought ‘un carnet’ which is ten tickets. There may be cheaper options, but we just went with what we were used to. 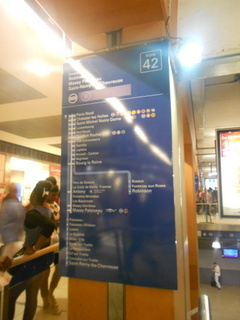 However the Métro stops as each station, so sometimes it’s handier to take the fast train for part of the journey. The RER. Which we did. 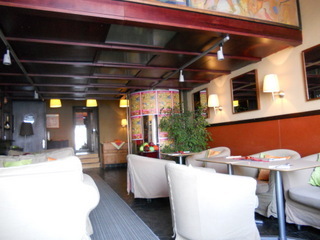 We crossed Paris to Montrouge where we had reserved a small hotel. As I can be quite obsessed sometimes I actually hoped we could quickly drop our luggage off and then be in time for the Sempé exhibition at Hôtel de Ville. So we went back to the city centre and walked across the Ile de la Cité towards Hôtel de Ville. 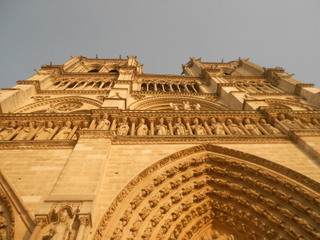 Nôtre Dame was still standing. Majestically. We quickly walked on. Arriving at Hôtel de Ville at 18.30. Too late to enter the exhibition. 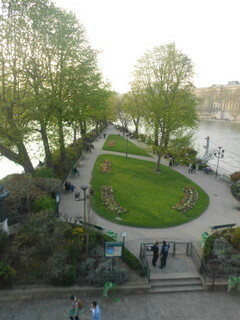 So we strolled back and wandered back to the Île de la Cité. I had done some research before coming here, just the day before leaving I found there had to be a little park at the tip of the island. We decided to have a look. Quite a nice little spot to sit in the sun isn’t it? We strolled along to the other side of the island on our way to get a bite to eat. At a corner of a street a lovely little band were playing. I made a little video. My first ever so please make allowances for the quality. Notice the lady in green dancing to the left. Isn’t that lovely? We passed quite a busy street with terraces on either side. 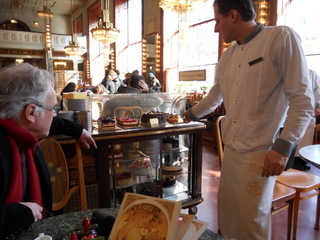 One restaurant was called the Café de Paris and since I liked the look of the salads which other guests were having, we decided to sit and eat right there. It was a good choice to have French food as our first meal. It had been too long since we were in France. Do you like the look of my salad? As a vegetarian it is quite easy to eat in Paris. 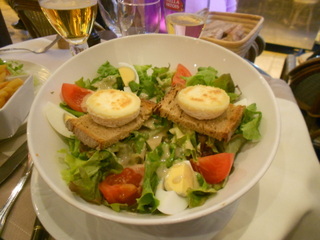 Just have ‘une salade crottin de Chavignol’, a goat’s cheese salad. It was lovely. The French Garçon (waiter) chatting as they do about the wine. Smiling, joking. It was nice to be back. Only a train ride away awaits a totally different world. Travelling definitely opens up horizons. 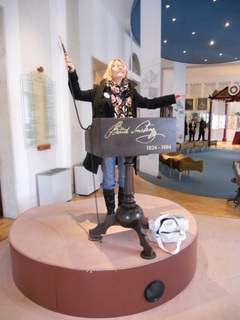 Do have a look at the other pages of my blog to read all about the exhibitions, bookshops and Parisian parks. 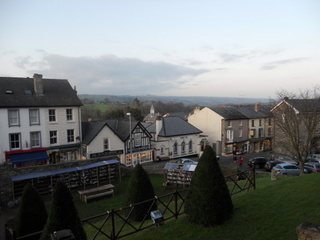 The same weekend we visited Hay-on-Wye we had packed our walking boots. 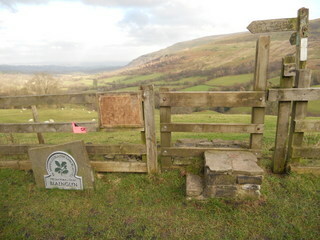 Since we were now going to be in Wales we were intend on doing a nice stroll. 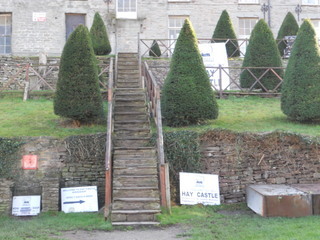 We stayed at the Caer Beris Manor in Buith Wells. 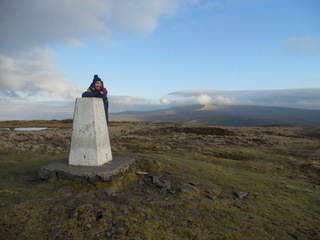 Powys, www.caerberis.com. Since it was the end of January I think we were the only guests. It’s a very nice hotel. 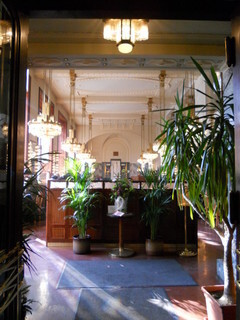 Staff were friendly and the room was perfect. Also I simply have to mention the WONDERFULLY tasty shortbread which was in the reception area offered complementary to the guests, i.e. us! 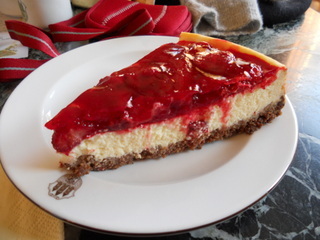 I must admit we helped ourselves freely since it was just soooo good. Below a few shots of the hotel from the hotel grounds. 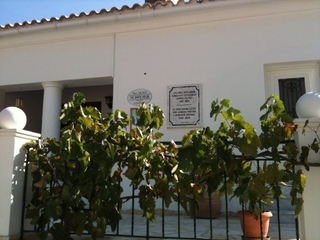 The house has a long history dating all the way back to AD406. 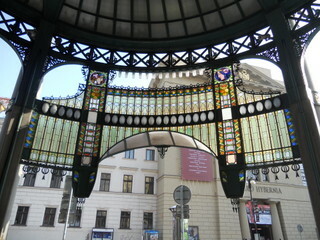 However it has been damaged and rebuilt many times. 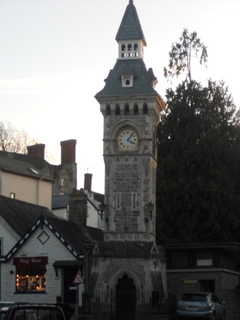 The foundation stone of it as it now stands is dated 13th October 1896. It was remodelled into a manor by Captain Charles Gam Harcourt Wood, late of the 15th Hussars.The dining room panelling dates from about 1570. Other rooms which are now hotel bedrooms include the Servants Hall, the Nursery, the Butlers Pantry and the Housekeepers sitting room. 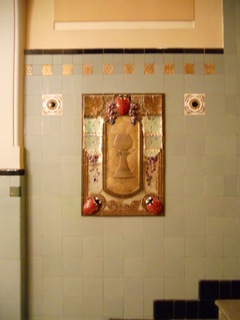 The original servants’ call bells are still to be seen on the ground floor. I loved the sight of it, made me feel nostalgic and I got visions of Mrs. Bennet ringing the bell for Hill..
After a hearty breakfast we set off. 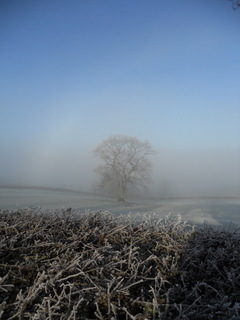 It was cold, but who cared, the wonderful spectacle of a hazy winter morning was awaiting us. 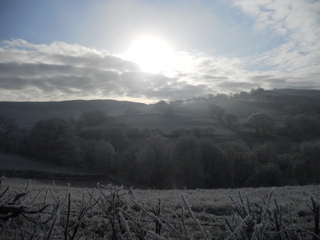 I do not exaggerate if I say that the scenery during this walk was one of the most beautiful I ever experienced. 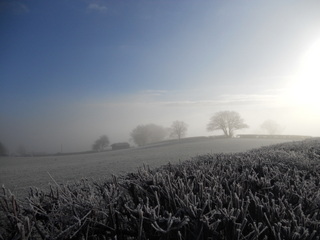 It was a combination of things: the weather, the landscape, the stillness. 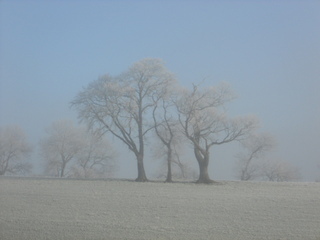 The frosty early morning haze covered nature with a thin layer of white pearls. It was magnificent. From the hotel you can do several walks. 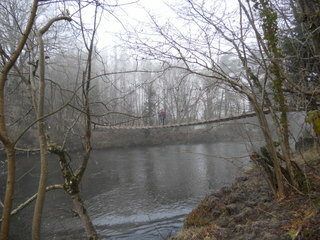 There is a hanging bridge crossing the river Irfon. The hotel has been built just in the bend of the river. Across the bridge we turned left. There is a little holiday housing estate we had to cross in order to cross the road to continue our walk. Although we had taken our fantastic book with walks in Britain, which we actually picked up in a book sale at a National Trust House for 50p (! ), the hotel also provides some maps with walks. In the distance we noticed a little church. 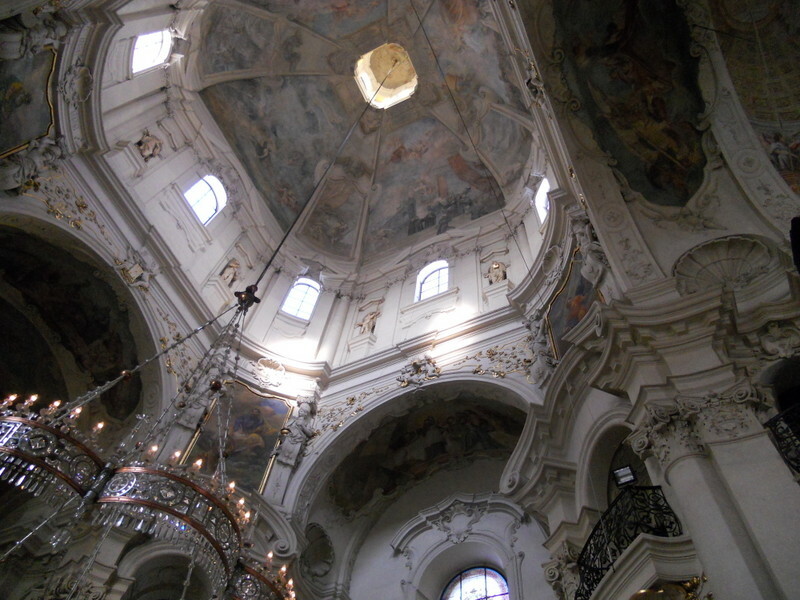 I was very pleased because I love churches. 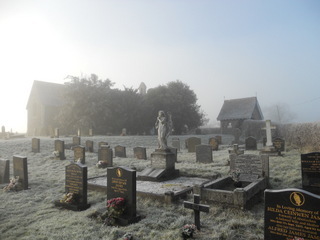 In truth I am a silence seeker and often silence is to be found in a church, or in its graveyard. 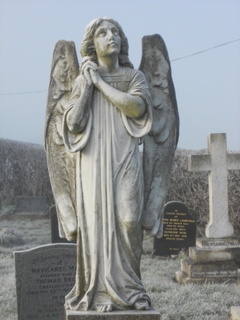 The angel stood out in the cemetery. It looked eerie and almost surreal. 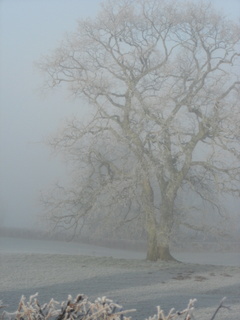 The entire setting did, it was the silence combined with the soft wintry light. The little pearls everywhere. We felt as if we had landed in a fairy-tale. 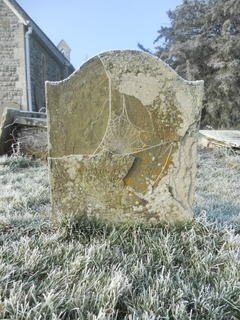 Then we came across this tombstone in which was displayed this fabulous spider’s web. 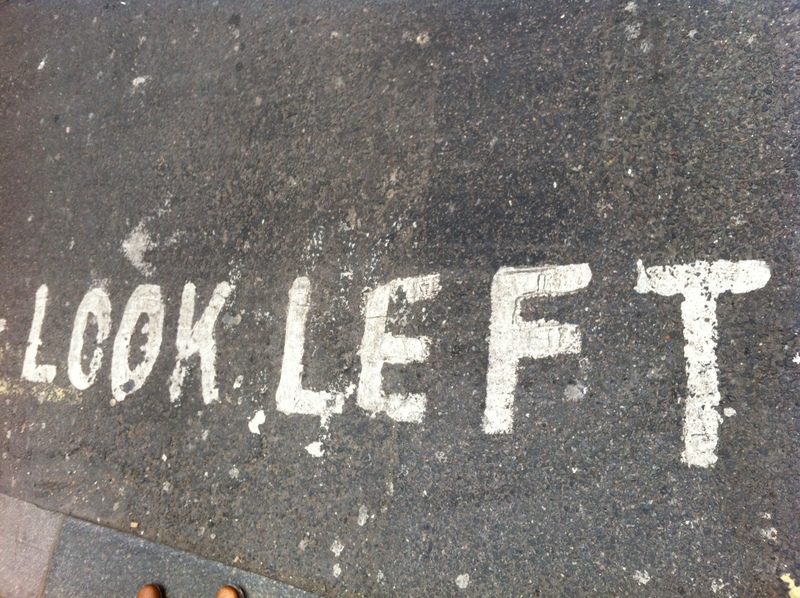 It looked as if an artist had deliberately put it there. 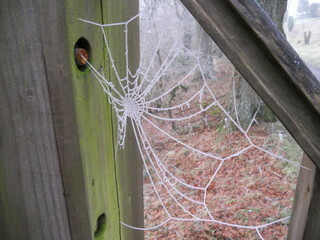 And it was true: Mother Nature is the artist. Notice the stillness of it all. 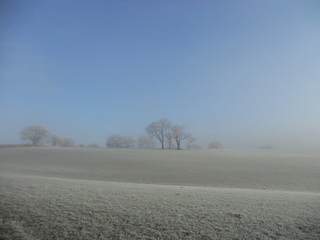 The only noise one could hear were our footsteps. As a Dutch person, undulating landscape always appealed to me massively. I still remember the first time we drove from Holland to France. As soon as one leaves Lille behind one finds this softly hilly landscape with all these hues of green. 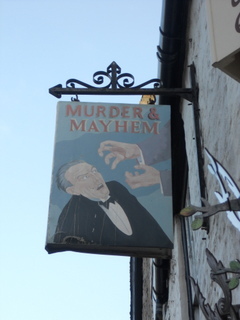 Wales is a bit like that. 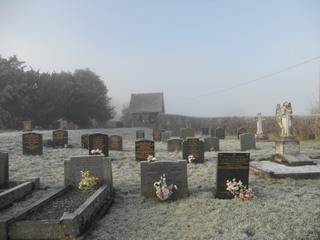 The difference being that it is even more sparsely dotted with villages The calm and peace of Wales have utterly touched me. The pictures above have been taken with my new camera, I did not used to have a camera, just used my Iphone. However Santa offered me this precious gift last Christmas and I am so happy with it. I’m still learning to shoot nice pictures, and above you can see what a different angle and light does to a pic. I like experimenting with it. It almost looks as if there was a filter on the camera lens, but of course there wasn’t. As you can see the early morning haze was lifting very very slowly as the sun chased the clouds and gave us this spectacular light show. Just for us. And after the little pearls had melted, a soft green, almost mossy coloured landscape revealed itself to us. 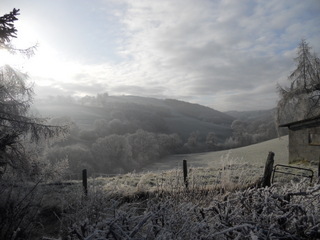 I thoroughly enjoy walking in the UK. I’m only just starting, but I already love it. It has been my wish for ages, but as a devoted mum I never wanted to leave the kids while they were little. So now with them having grown into young adults its MY time and boy am I enjoying it. 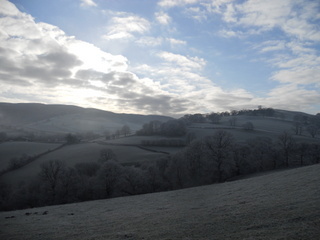 The pictures above were taken in the morning during our walk around Builth Wells. In the afternoon we were heading back to the Cotswolds where my partner lives, but we stopped along the way to do another walk. 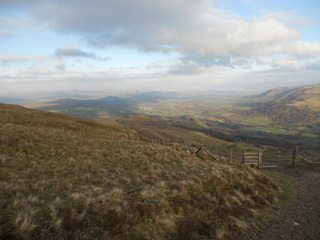 We did 4 miles in the Breacon Beacons of which the pictures are to be found below. 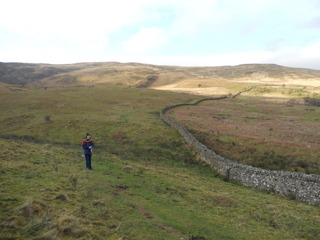 A totally different scenery of course, now we were no longer walking between meadows on a narrow country road, we were on the footpath which took us through much rougher ground. We reached the top. Boy it was cold. I know it’s a silly hat but it kept my ears warm. 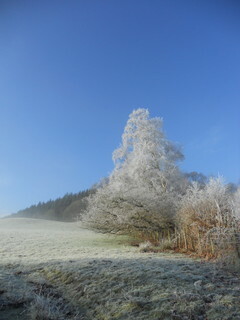 After this walk it was definitely time for a cuppa. We were really pleased with ourselves. 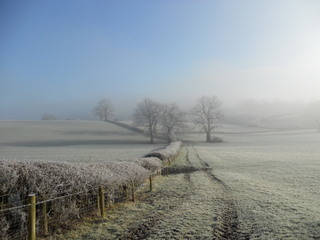 It’s lovely to make the most of your day and the outdoor exercise makes you feel so alive. 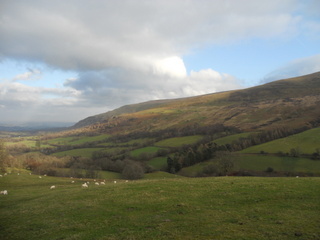 So now I got a thorough taste of Wales. It made me resolve on one thing: I will come back. Actually I am going to do a long distance walk in a few months. 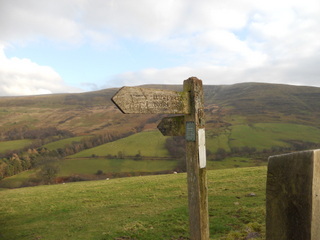 The Offa’s Dyke path. And you will be reading all about it on this blod if you choose to. 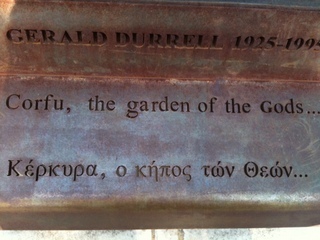 This post is about Gerald Durrell, protagonist of the Durrells, and about the synchronistic events which led me to Corfu. Life can be miraculous at times. Makes one feel certain there is more to it than meets the eye. Take today for instance, sitting on the lush garden settee under the enormous umbrella at Isabella Country House in Gouvia, Corfu. Just a few feet away the blue swimming pool shimmering in the sunlight is begging to come enjoy her. The garden, well kept, with a perfect, green lawn, bordered by huge bougainvillea and oleander, still flowering although maybe a bit more sparsely than at the beginning of the summer. Tall grown palm trees and other exotic ones of which I don’t know the name, softly moving in the silky wind. While autumn was setting in in the UK where we flew in from only three day ago, the summer seems to linger on lazily on this paradise island where the sun warms our milky white bodies which need intense protection with high factor sunscreen to avoid the massive sunburns. The sun is lovely. Such a delight. 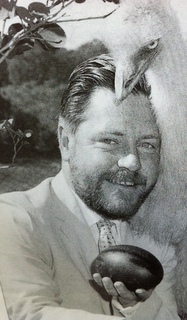 I am reading the enchanting, very well-written and thoroughly detailed authorised biography of Gerald Durrell, authored by Douglas Botting who takes you on a fabulous journey through Durrells life. 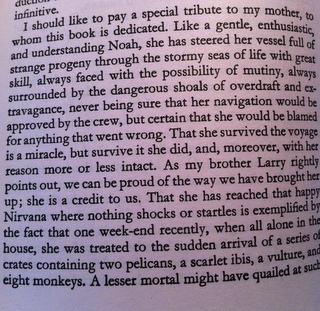 Page after page you feel the admiration of the biographer for his subject, and page after page you get more and more immersed in the passion and enthusiasm of a person who, although described as an eccentricity due to his quaint upbringing, you sense to have been a credit to humanity and a truly lovable person. On discussing where to go on a weeks vacation after the summer season, two requirements had to be met. 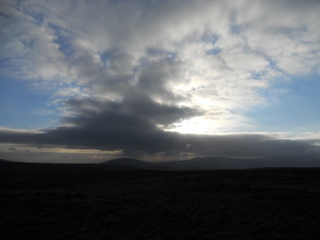 Firstly: we needed the sun, and secondly: it should not be too far a flight away. Last year we had visited Luxor. I had been absolutely thrilled by the wonderful weather and exotic surroundings. Floating at the edge of the infinity pool, watching the cruise ships go by on the Nile, while silver herons, funny Egyptian ground peckers (I suppose them to be related to the woodpecker or the jay, they had this long curvy beak which they used to peck the earth) and, ‘honest to Gods’, real pelicans flying by without any awareness of the exotic impression they made on this not so well travelled tourist from the Netherlands. It would by no means have been a punishment to return to that lovely place, however the world was so full of unknown places, so after some thorough consideration we decided Greece was to be our next destination. The problem with Greece was just the countless number of islands to pick from, and since decision making isn’t one of my qualities, I wondered where to go. Luckily a colleague of mine happened to offer the solution to this decadent problem. Upon her arrival at a reunion in my practise, she was much admired for her colourful blouse adorned with a lovely coloured necklace made of painted wooden buttons. I complimented her on her attire, asking her if she had made them herself. Which would have been highly probable since we are all art therapists. 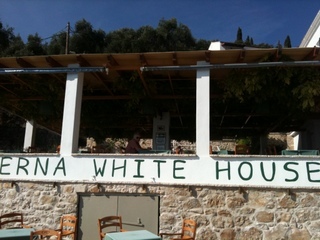 ‘Actually I got it from Corfu, where we just were on a weeks holiday last week.’ She told me.’ So I jotted down the name of the place she had been staying at: Isabella Country House, Gouvia. A few weeks later I mentioned this to my partner and next thing I knew he booked us up for a week at that same apartment hotel. Already something must have been stirring in my subconsciousness, I got out my old yellow paged penguin copy of ‘My family and other animals’ and leafed through it. 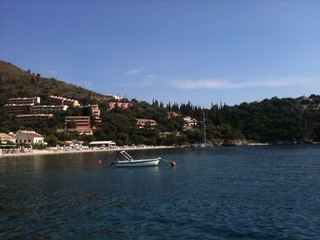 And yes, I remembered correctly, Gerry had spent his magical youth on Corfu which was now exactly where we were going. I hope, you, who are reading this, can relate to the feeling of bubbling excitement and inner anticipation which you sometimes get when joy overwhelms you. Like a three year old. I simply could not stop smiling. 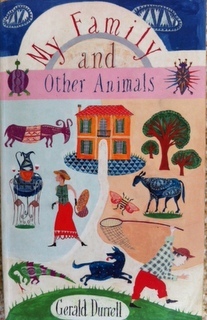 There was no way to hide my happiness at the foresight of visiting Corfu, where the author of my all time favourite book had lived and developed his passion for animals. And so there we landed at Kerkyra airport. 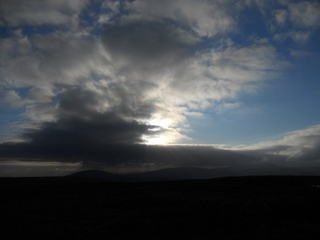 It was 22.00 pm and the sky was pitch black. During the drive in the taxi from the airport to Isabella’s, we managed to catch some outlines of dark mountains against the even darker sky. We got a glimpse of lights surrounding a half moon shaped bay, but that was it. 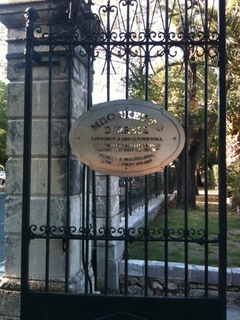 The taxi dropped us inside a gate and drove off. There were two villas. Which was the one to turn to? 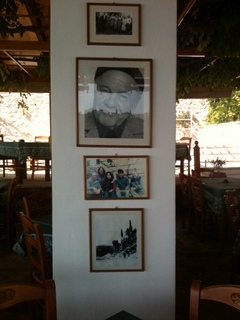 My friend baldly went up the steps of one of the villas and returned with a gentleman by the name of Mr Socrates. I forget his last name. A friendly rather slim Greek gent with smiling soft dark eyes and a strangely careful demeanour, almost as if he was moving constantly in a room filled with priceless crystal and Lalique glass ornaments or so, which his every move was intent on preserving with all his might. His English was adequate although limited to my ears. Being Dutch, the Greek accent needed adjusting to. It was a sweet accent cuting up his English, but to me somewhat puzzling. For instance, when he kept referring to the bath as the tube making me wonder what tubes could be and confusing me into thinking there was an underground on the island. All was cleared up to me in due course, when after Mr. Socrates’s carefully trodden departure, as if going through a mine field, my partner informed me there was no bath in our apartment and did I mind? As it dawned upon me that Mr Socrates had been referring to a tub not a tube.., I pondered the question for a moment concluding we would see about all that in the morning. I proceeded to put the kettle on. 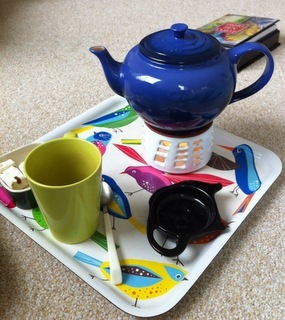 Since the act of tea drinking to me is as normal to me as endless smoking is to a chain smoker, one of my traits which does not distinguish me from the Brits and which rather inclines me to think I must have been British in a former life. How to describe the feeling after awaking in the morning and opening the door to the little patio of our studio? Let me attempt it, but mind you the real thing was way better. The patio was overlooking the lawn and the lovely green garden. Considering the heat on this island, I was astonished to see everything so green. Out of nowhere a very slim, although skinny is probably the better word, cat appeared. Her ear was strangely askew which gave her a bit of a shabby look. She was friendly and started meowing to me, clearly she had just had kittens since her teats were swollen. She was craving food incessantly. Incidentally, the weak hearted guests staying in other apartments all bought her food, as I understood from the number of saucers on the patios. So there I was, sitting on the huge garden settee, absorbed in the autobiography, while continuously aware of my luck and filled with gratitude for the marvellous temperature and surroundings. We were transferred from the Strawberry Pink Villa to the Daffodil Yellow one, since my decadent luxury loving ego wanted a tube, I mean bath. This was the only thing missing in the tiny apartment really, which otherwise was very sweet. 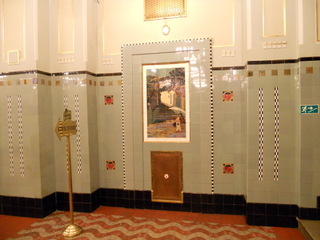 What with the pale yellow furniture and the Greek blue tiles it looks a picture to be sure. However we wanted that bath, and were just waiting for the Greek housekeeper Angela to tell us when the cleaning would be done. A discrete young man apparently from the Philippines was charged with this task which he carried out meticulously and almost like a fly on the wall, since one did hardly hear him, we just saw him move about silently, starting early mornings when he took care of the pool and garden furniture. Angela, both housekeeper and manager made sure the guests were completely satisfied. She was in her late thirties with black hair and a pleasant smile. In a sudden impulse I asked Angela could I ask her a question and in her Greek accent she immediately welcomed me to it. 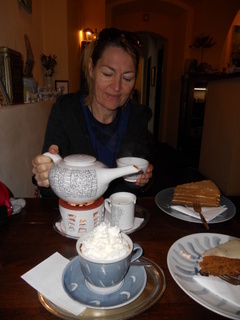 ‘I wonder if you can tell me if there is a tourist office in Kerkyra town?’ Angela listened intently to me, but the frown on her forehead caused me to think she did not seem to know what a tourist office actually was. ‘Do you know what I mean? A place for tourists to collect information and maybe a map and ideas about the sights to be seen on this island?’ I explained. ‘Ah, I see yes, but no we don’t have that, I think. 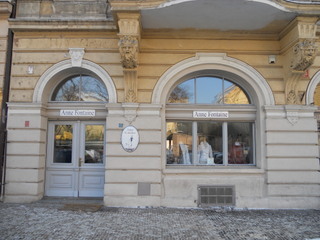 Maybe tourrrists shops will have maps, yes in Corfu town, and maybe in Gouvia. Why you need?’ It was obvious that being a tourist probably was not so much on Angela’s list of daily activities. 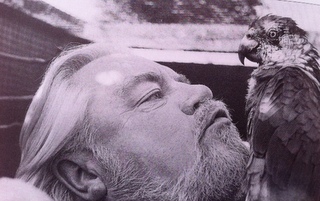 I now said I was looking to see if there was any information about Gerald Durrell. Frowning again Angela did not understand the name clearly I suspected. I held up the book and showed her the cover, pointing out the name of the author to her. Rather expecting her to look even more puzzled I was happy to see that she wasn’t. Now that was very sweet of Angela, I was pleased but did not expect much of it. I had not been able to trace anything of great help on the internet before leaving. Which surprised me, as it was such a shame. This expectation was very doubtful of me and not showing any confidence in my fellow human being. On Angela’s coming back I was both humbled and wonderfully delighted. ‘Mr Socrated knows very well about Misterrr Durrrrell’ She hesitated about the name. 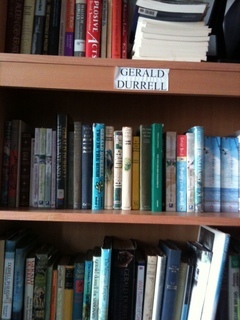 ‘Mr Durrell’ I pronounced showing her the name on the cover of the book again. My eyes must have started to shine instantly because Angela smiled broadly at my great enthusiasm. 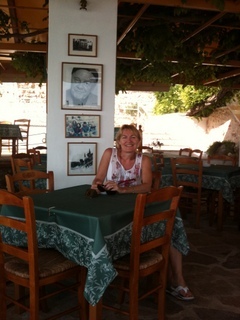 ‘Yes, the statue is in the park in Corfu.’ Angela explained to us in detail how to get there. Thanking Angela profusely I looked at my friend who smiled. He knew the lazing by the pool was over. 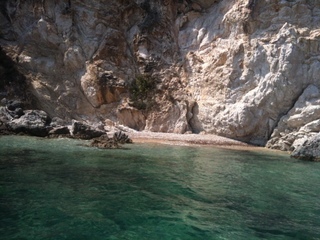 We were heading to Corfu town. A hire car had been delivered to us an hour or so earlier and so we got ready and headed for adventure. Plaque would be more accurate probably than calling it a statue, however it’s a true tribute and a well deserved one in my opinion. 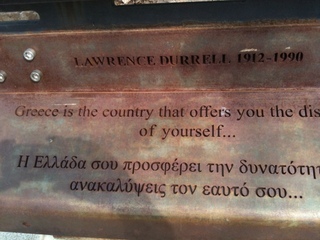 Since both Gerald and Lawrence Durrell wrote about their lives in Corfu, which actually affected the island economically in a very positive way. 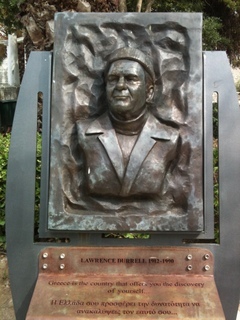 Lawrence Durrell has written quite a few books. His first was the Pied Piper of Lovers, another, Prospero’s Cell, is set in Corfu. He won a the Duff Cooper Prize for Bitter Lemons and it was later speculated he would win the Nobel prize for literature, but this was not to be. Larry was born in Jalandhar India 27th january 1912 and died in Sommières Languedoc, 7th nov. 1990 aged 78). 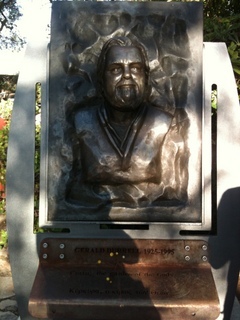 Gerald was born in Jamshedpur, India on the 7th of january 1925, he died the 30th jan. 1995 aged 70. I was thrilled to have found these statues and was to live even more joy soon. 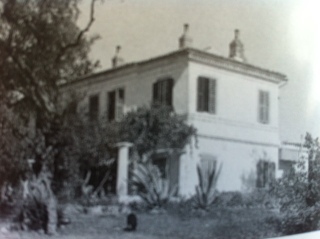 On returning to Isabella’s the excellent Angela had collected for us the telephone number of a Doctor by the name of Giourkous, who would be able to tell us more about the Durrells. By now I felt like a hound on a trail. 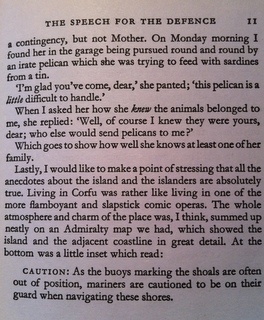 I was determined to find out where the Durrells had lived on the island. So we called the doctor. 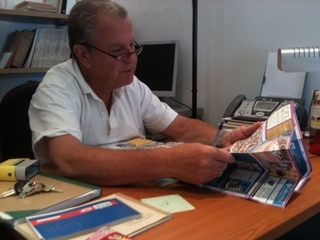 It was his pleasure to receive us and give us more information. 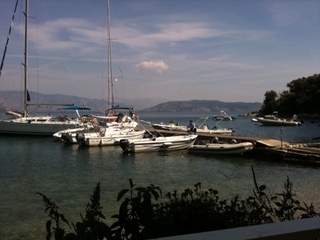 So off we went again to Corfu city. It’s an article in the Guardian stating that Corfu plays a belated tribute to the Durrells. We were asked in by the doctor. He was true to his word and gave us a treasure of information. 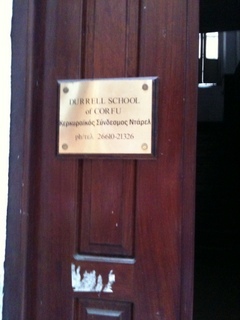 Not only could he tell us a bit about the whereabouts of the Strawberry-Pink, Daffodill-Yellow, and Snow-White villas, he also told us there actually was a Durrell ‘School of Corfu which had been founded and could be found in Corfu city. The wonderful doctor showed us a map and indicated the whereabouts of the school. Furthermore he was happy to show us some locations himself if we would like and would come back another day. Unfortunately we had no time to do so, and anyway the doctor already had been more than helpful. 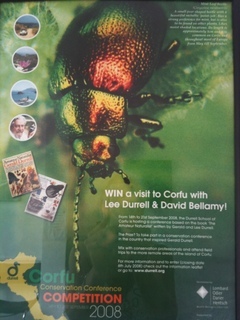 We set off to the Durrell School.. 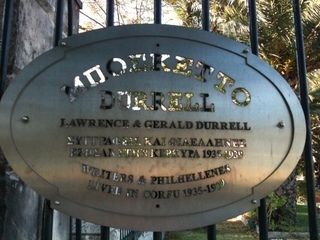 The Durrell School of Corfu offers a variety of activities, ranging from a series week-long seminars to excursions that explore the rich cultural history of the Mediterranean basin. Past and future field classes include Butrint (Albania), Old Perithia (Corfu), Lia (mainland Greece) and Kalami (Corfu) as well as walking tours of historic Corfu Town and its colonial architecture. 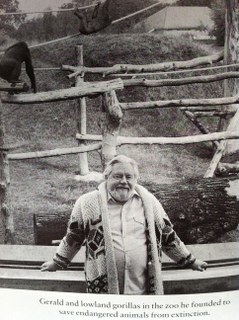 The Durrell School now also hosts visiting courses and workshops, providing unparalleled organizational support and background to the history and culture of the area, as well as an introduction to the work of Lawrence and Gerald Durrell and other writers connected with the region. 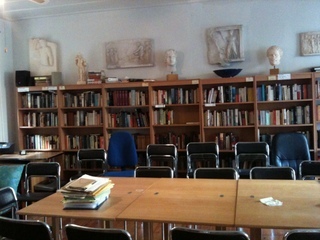 If you are interested in bringing a writing workshop or a visual arts workshop to the Durrell School, please click here. Moderators and Distinguished Visiting Writers for 2008 and 2009 included David Bellamy, Hugh Bennison, Joseph Boone, Jan Morris, and Mark Morris. 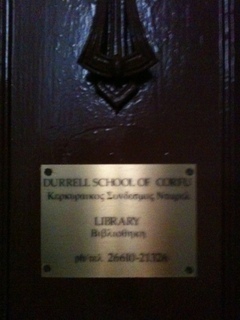 Anthony Hirst was introduced to us and he explained us about the intention of the school and he obligingly allowed me to take some pictures of the library with books by both Durrells in various translations. We did not want to take up too much of Mr Hirsts valuable time, we had already come rather unexpectedly. 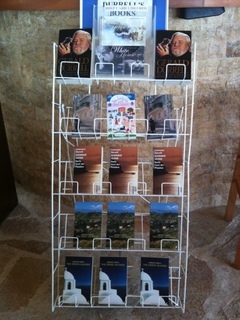 We thanked them very much and were given some books. Upon leaving I was determined to write about this experience in a blog. It took me a while, but here we are.. Presently we were off on a hunt for the three villa’s. Unfortunately they have not been preserved as museums. We managed to find the location but the strawberry-pink villa has vanished alas. In my opinion a terrible mistake. 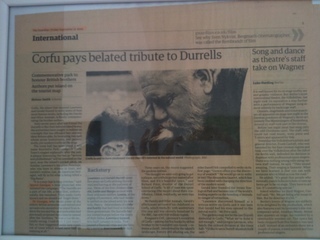 But then again the header of the article in the Guardian says it correctly: Corfu pays BELATED tribute to Durrells. Such a shame, this means some things have been lost forever. 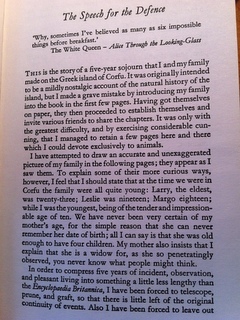 The only picture I can produce of the daffodil-yellow villa is one from Gerald biography, here we see the family posing in front it. 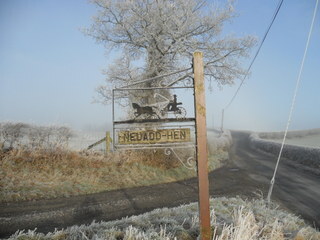 Picture taken by Leslie (Geralds other brother) in the winter of 1936. 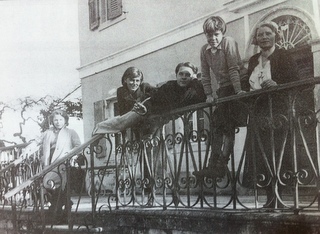 From left to right: Margo, Gerry’s sister; Nancy, Larry’s girlfriend; Larry; Gerald and Mother. 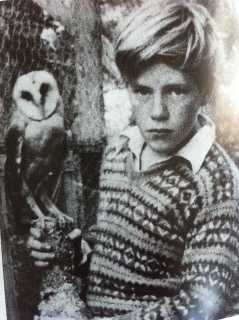 In this picture we see the young Gerald with an owl. In one of the woollen pullovers which at some point his mother allowed him to stop wearing, since Corfu was way to hot. 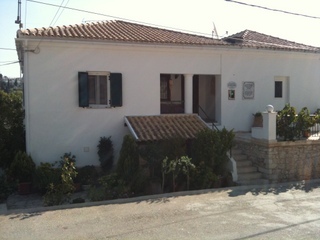 The picture below is the Snow-White villa, last of the Durrells’ three houses. 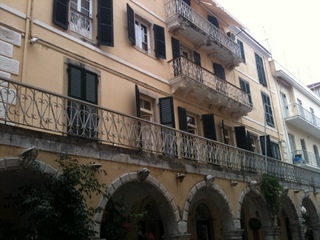 It was built at Criseda as the weekend retreat of the British Governor of the Ionian Islands in 1824. 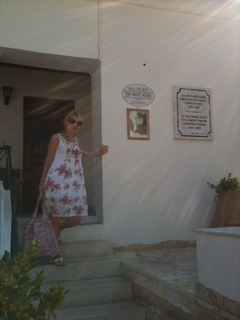 We did manage to find the house in which Lawrence Durrell lived when he married. 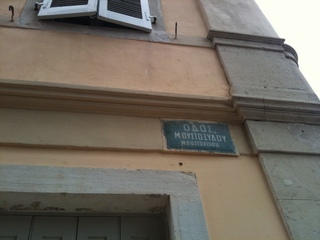 It still exists, oh joy of joys, and actually is a taverna annex hotel. 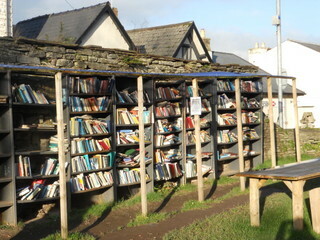 There are some books for sale. 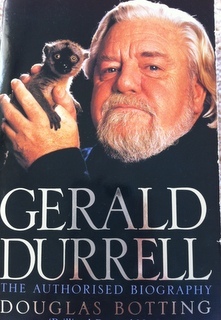 Gerry’s biography and of course My family and other animals. 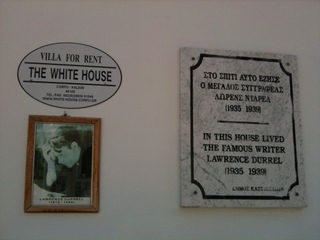 And needless to say books by Lawrence who lived in the White House. 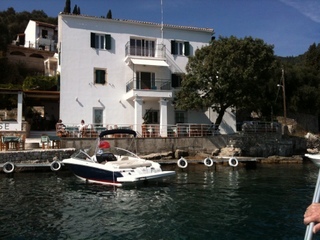 The taverna rents out boats. I was enthusiastic about that. 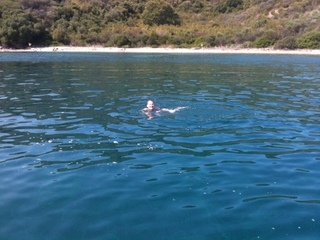 I thought Corfu would be great to see from the water. It would give us a feel of the life on an island, since all islanders have boats. Gerald had a boat : the Bootle-Bumtrinket, made for him by his brother Leslie. I thought it was a great idea to hire a boat. I needed to convince my dear friend since he was a tiny bit concerned about not being able to steer a boat. I must say I did not have any experience with a motor boat myself, since in my youth I used to only do canoeing. However I managed to persuade him and after getting used to the driving of the boat he was pleased I did push him into it. See how well he managed? I felt elated. I was trying to think how it must have been in the days of the Durrells. Hardly any foreigner on the island of course. No tourists, hardly anything to disturb the peace. 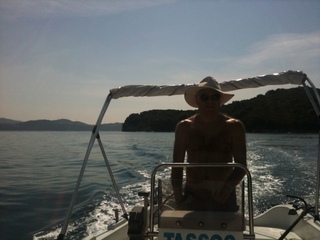 Boating from lagoon to lagoon and diving into the wonderful blue water warmed by the ever present sun. It was heavenly. Turning a corner and feeling a little peckish we just steered the boat to this little jetty and got off to sit ourselves on the terrace of one of the many tavernas. It felt great to be able to enjoy such a wonderful time. Totally unexpected and savoured to the core. 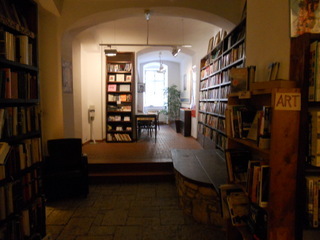 On our way to the Kafka museum we passed a tearoom with a sign stating it was the first ‘non-smoking’ tearoom in Prague. This tearoom we obviously had to visit. We decided to do so after visiting the museum. 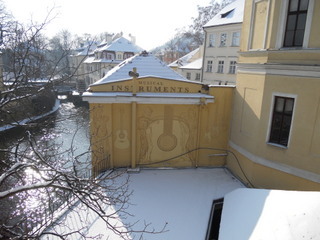 By the way: when you are walking through Prague, you pass through all kinds of nice streets and find lots of little treasures. 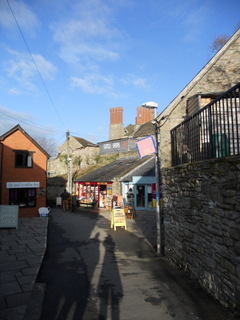 Galleries, small shops, cafés and restaurants. 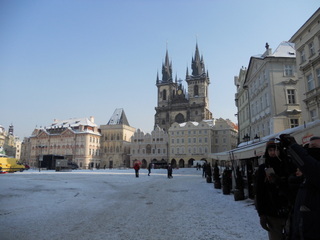 During our weekend in Prague we did everything on foot even though there is a very adequate network of trams, metro and buses. We never took any. This time there was no need for us to do so, however when we will go back to visit the city in another season, we intend to take a tram to the end station and see what’s cooking on the outskirts. Back to the first non-smoking tearoom. 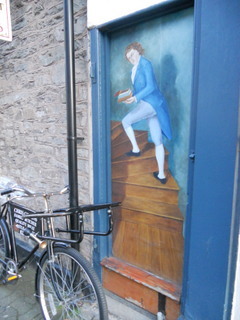 It’s got a nice painting of a sheep above the door and for art overs an art gallery next door. Looks nice doesn’t it? 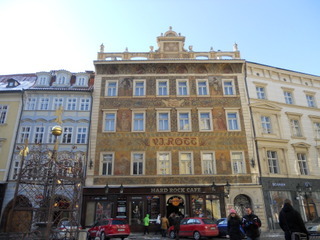 Name of the café which theoretically is not a tearoom is Café Kafíčko, addres Míšeňská 10, Praha 1-Malá Strana, close to metro Malostranská or Malostranské náměstí. The cakes were home made, I had a honey cake which was quite nice. 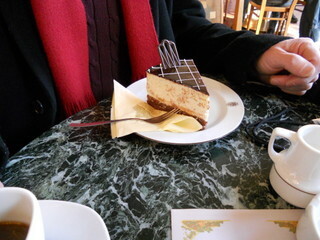 My friend had a carrot walnut cake which he ate with considerable speed so it must have been a treat as well. Real friendly staff although communication was a little difficult due to our non-existent Czech skills and their modest English skills. I must say I actually rather like that when travelling. It makes you resort to a lot of gesturing and even doing little drawings to make yourself understood. 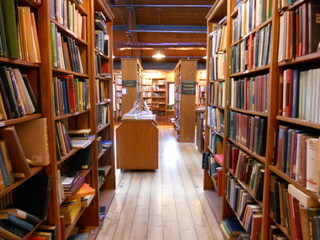 Paradise on earth for the book lover. 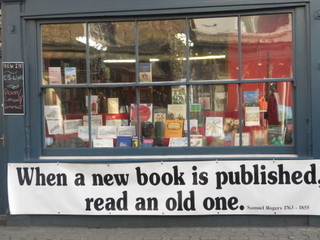 That’s Hay-on-Wye in one sentence. I visited this little town in 1991 with my husband. 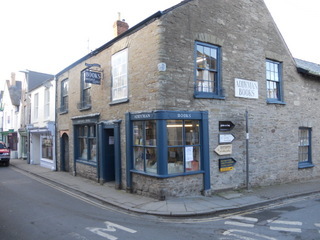 We had heard about this village which was at that time described as the village with most bookshops and second-hand books in Europe. So we went. Indeed it was a great find. I still remember our surprise upon finding that some of the shops had a message up saying: please put money in the tin. 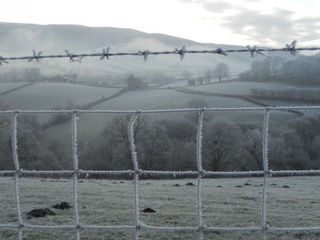 Years later I eventually returned to Hay. It was January 2012. 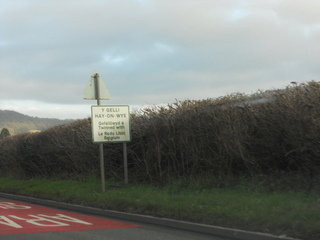 The weather as you can see was not particularly appealing, but Hay was and I insisted on taking a pic of the sign with the name of the village on.The sun came through several times though. 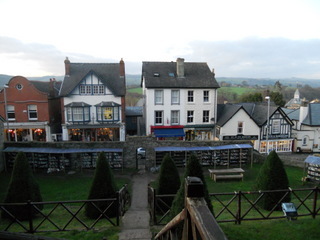 We left the car at the car park and walked into the village. At that point we did not have any map so we just followed our noses and I haphazardly took pics of any bookshop that came in sight. 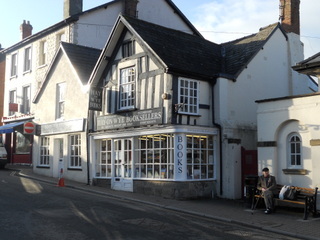 It’s quite amazing to see such a small village with such an amount of book shops. Every corner you turn you bump into a new one. In 2000 I trained with Deepak Chopra to become a meditation teacher at his network. 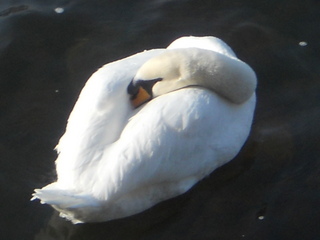 The type of meditation we were taught was PSM (primordial sound meditation). Seeing this sign made me smile. One of the things we were told was to always beware to meditate in the sun. 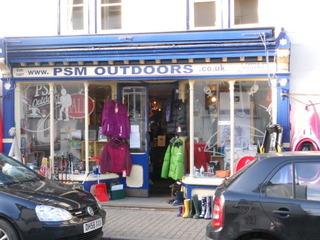 So seeing PSM outdoors made me reminisce.. 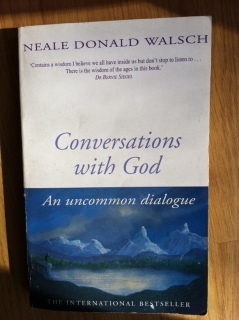 The fun thing about this was that a friend of mine in Holland had told me the week before that I should pick up Conversations with God part 1 again and do a re-read. And there it was, it fell right into my hands in Hay while playing this fun game. 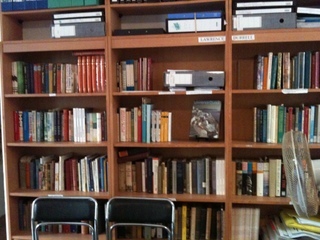 And there were no other books on spirituality on that shelf nor on the shelves above or underneath. I checked. 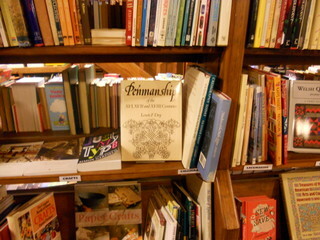 I was of course intrigued so picked up the book standing next to this one. It happened to be the diary of Teresa of Lisieux. This book I purchased years ago in France while on a personal pilgrimage to Lisieux visiting the Basilique and doing the Teresa walk through the village. 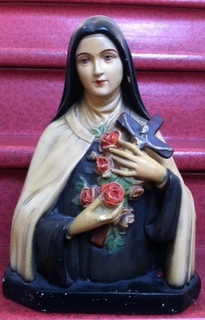 Teresa was a very devout girl who wanted to join the Carmelite convent at the age of 13. However it was not allowed for anyone that young to take such a vow. The next year the family went on a pilgrimage to Rome to see the Pope. Teresa was instructed to not look up and definitely not speak to the Pope. He would bless each pilgrim while placing his hand on their head. When it was her turn, the by then 14 year old Teresa looked up and asked the Pope if he could please allow her to enter the convent right now. It is said that the Pope smiled and was somewhat amused but said to her she should ask her local bishop. Anyway, at the age of 15 she was admitted and she took up the brown robe. Little Teresa was now a Carmelite nun who chose the name: Teresa of the little child Jesus (actually when Mother Teresa took her vows she chose her name in honour of this Teresa and not after Teresa of Avila). How come I am writing all this? Well to me the little saint Teresa has been a stunning example of a person who was content being only a small flower, a simple daisy. ‘Dear God let me be a tiny daisy which is nothing compared to the splendour of the Lily and the Rose, let me be this little flower which makes the others shine and stand out to even greater advantage’. She was modest and totally fine with being so. She trusted Jesus would shed his love on her as he would on every blade of grass. She was forever trying to not be judgemental and praying while doing her work. I was very touched by her life. She was asked to write about her life in the convent by the Mother superior. When she was 23 she contracted tuberculosis and was severely ill. She died with a smile on her face. Totally trusting she would be awaited by Jesus. She said: ‘Je veux passer mon ciel à faire du bien sur terre’, meaning I want to spend my time in heaven helping those who are on earth. After her death her diary was found and published. The purity of her mind and the unconditional trust and love of the girl were such that she was made a ‘docteur de l’Eglise’, i.e. she was made a saint by the Pope. 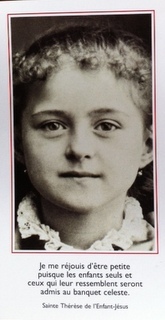 Saint Teresa of the Small child Jesus. Everyone who prays to Saint Teresa when in need can ask her for a sign. This will mostly come in the form of a flower on your path. 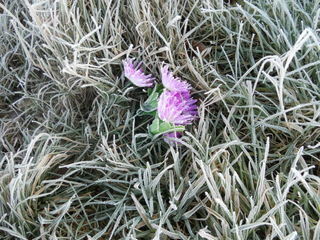 I myself have had flowers appear miraculously on my path in times of great distress. I learned about Saint Teresa through my nan. My grandmother once told me a story. It was during the war and she had no money. Nothing to buy food for her 3 children. Grandmother always used to pray to Saint Teresa. She would then ask for a sign that all would be well. After leaving the church she crossed the street and found a ten guilder note on the pavement. In those days that was a lot of money. I have always felt that it was all right to be small and modest. Not everyone can be a rose. That is probably why Teresa struck such a deep chord within me. I am happy to be small because only children and those who resemble them are to sit down at the celestial banquet. 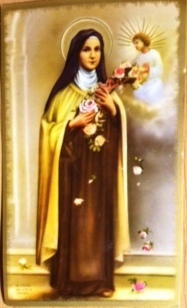 In catholic churches you will recognise Saint Teresa by her brown clothes and by the flowers (roses) she holds. The roses are covering a cross she carries. This bust of Teresa sits in my house. I came across it one day while visiting the Museum of Holy statues in Enkhuizen, the Netherlands. 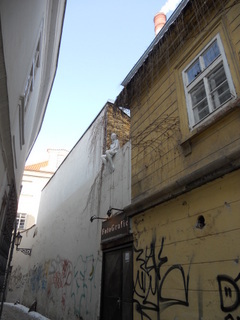 The lady of that little museum has over a hundred statues in her basement. She also had a nice statue of Teresa. I asked her which Saint she preferred and she told me Saint Nicolas, he is what Santa Claus is to the English and Americans. She asked me which Saint I preferred. I told her Teresa. She turned out to have this bust of Teresa which she was happy to sell. I said I probably could not afford it, but she gave it to me for 10 pounds. 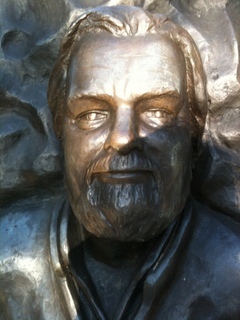 That made me realise this bust was meant to be with me. And it has been for over 10 years now. Reminding me of the purity of this little French girl. And then one day I am in Hay-on-Wye and I pick up not only Neale Donald Walshes book, conversations with God, but also come across the English version of Saint Teresa’s book. Is that a miracle? To me it is miraculous that is for certain. And before you ask: no I am not a catholic. I am a person who believes in this great big field, this reservoir, this field of full potential, from which we all come and in which we all thrive, even when unaware of it. And in this field of consciousness, miracles happen. I have lived many. 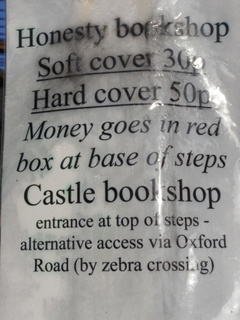 The red box for the money at the Hay castle book shop. 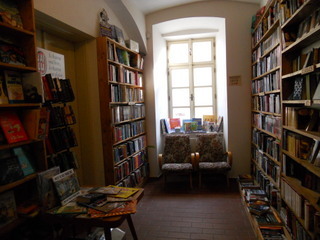 This is also one of those typical shops that makes one just want to step inside and browse endlessly. 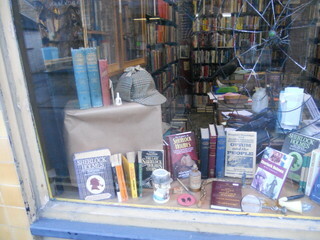 I love detective stories and have read a great many. Unfortunately we did not have time to visit this shop. Still I console myself saying that I will shortly return to Hay and then will make up for all the things I missed last time.. Terrible goose me, I forget the name of this shop. However I will find out later and let you know. 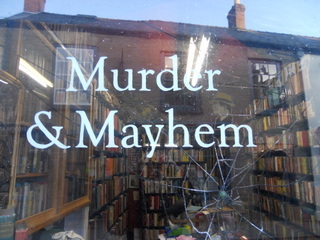 In any case this is a wonderful shop. 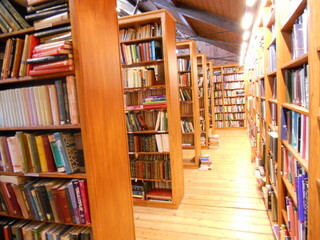 It’s all wood and books. 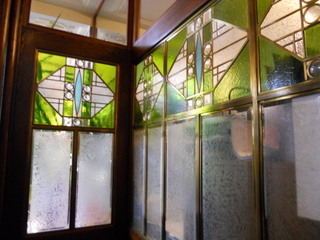 And a very nice tearoom to add to that. Notice my wonderful walking boots please. Not elegant, but soo comfy..
Great shop innit? And then I suddenly came across a heron. As you can see above. Now to me the heron has a particular meaning. (yes, yes, I attach great meaning to things other people raise their eyebrows over. I consider myself the Fool, the numberless number in the Tarot, so just bear with me ok?). In the secret language of animal totems the heron means: going after your goal aggressively, without hesitation. Also it means: do things alone. Don’t wait for other people’s approval. Just go your own way and you’ll be fine. 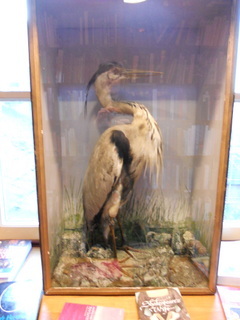 The heron has been my totem for umpteen years. In Holland, where I live, herons galore, but very often one specifically crosses my path. Sitting down on the roof of my house, or at the pond just below my house. Or sitting down on the street lantern in my alley. Really quite conspicuous. Anyway. 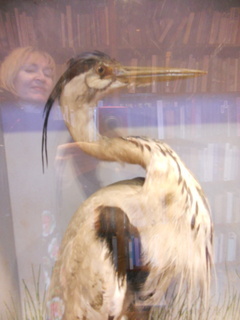 I hope the pic below is clear: you can see both the heron and me mirrored in it. For any information on the language of animal totems I can refer you to the books by Ted Andrews or to his Totem Animal Tarot deck. I like drawing as well. 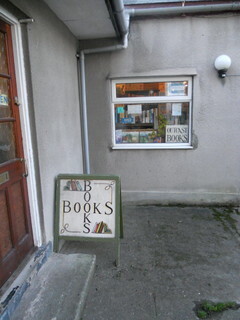 This sign above left is simple but to me lovely with the drawn books. 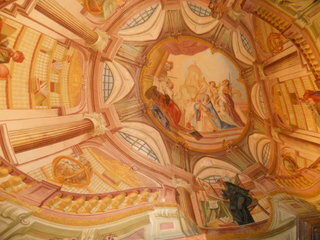 And the trompe l’oeuil above I found in a street painted on an outside door. The man is stealing upstairs with a pile of books in his hands. I can relate to that. Nothing better than coming home from a second-hand-book-find-spree with a stack of books. Making a cup of tea and nestling oneself on the settee with the new found treasure. 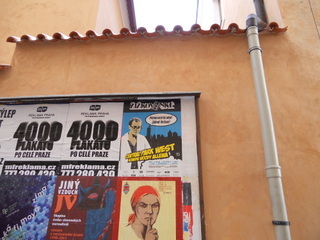 Wandering through Prague we bumped on the poster of Kafka as displayed in the header of this blog. Actually a very alluring poster for the art lover. 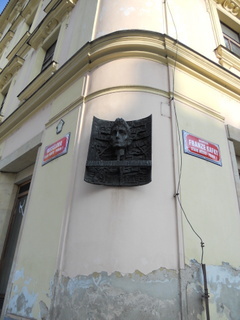 We decided to visit the Kafka museum. 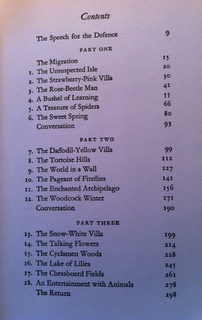 Even though not a connoisseur of his books the memory of reading the Metamorphosis at the age of 17 was still vivid. The uneasy feeling I got while reading this story, even though at the time I probably had no clue about the deeper meaning of it, never left me. Whenever reminded of Kafka this uneasy feeling came back. 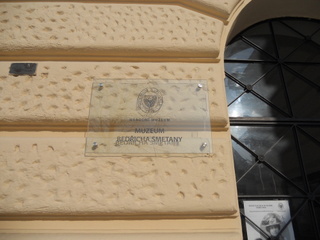 Therefore a) he must be a fantastic author, b) I must have been quite vulnerable to the atmosphere of the story and c) it was imperative I visit the Kafka museum. I must say I also was a little apprehensive. 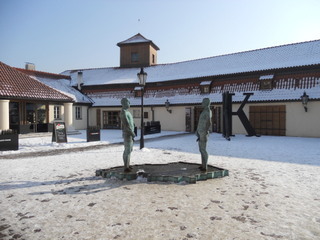 This feeling of unease was nothing but a foreboding of the gloomiest museum I ever visited.Upon arrival we were surprised by the work of ‘art’ in front of the museum: a little pond with two men in it, peeing.. 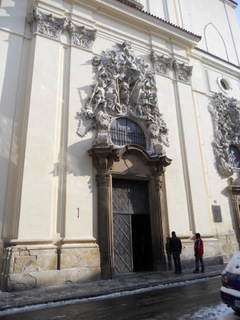 The entrance of the museum. So far so good. A huge K indicating this was it. We entered. Once again it was very quiet. No tourists around yet. 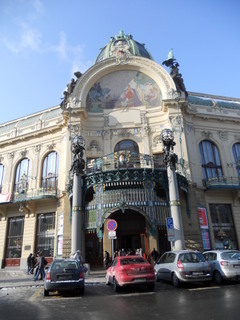 When we were at the Mucha museum we purchased the tickets for the Kafka museum. This way we would not have to stand in line and we got a 50% reduction. There was no line. We were the only ones there. The girl at the desk gave us directions and urged us to keep our coats on since it was very cold upstairs.. 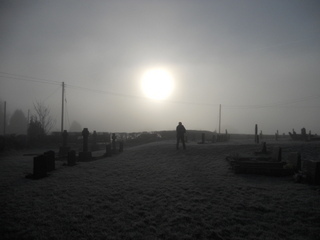 It was very cold indeed, and very dark. 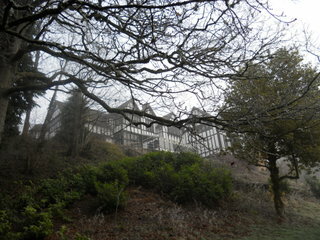 The windows had been blackened to create a dark atmosphere. Everything was black. The cold spread out from physical cold to emotional cold after reading Kafka’s life’s story which is being told in pictures. The more one reads, the more uneasy one gets. 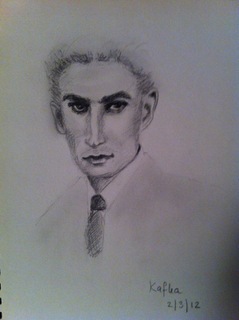 Kafka was a culturally influential German-language author of short stories and novels. Contemporary critics and academics, including Vladimir Nabokov,regard Kafka as one of the best writers of the 20th century. The term “Kafkaesque” has become part of the English language. Kafka was born to middle class German-speaking Jewish parents in Prague, Bohemia, then part of the Austro-Hungarian Empire. 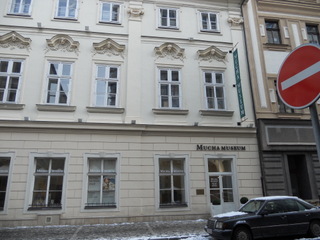 The house in which he was born, on the Old Town Square next to Prague’s Church of St Nicholas, now contains a permanent exhibition devoted to the author. 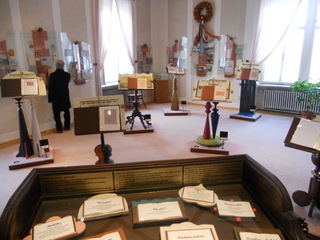 Most of Kafka’s writing, including the large body of his unfinished work, was published posthumously. 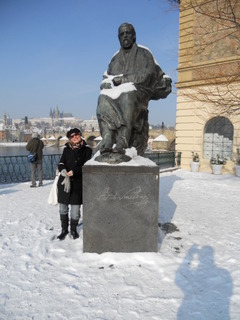 Kafka was born into a middle-class Ashkenazi Jewish family in Prague (now the Czech Republic). His father, Hermann Kafka (1852–1931), was described as a “huge, selfish, overbearing businessman”and by Kafka himself as “a true Kafka in strength, health, appetite, loudness of voice, eloquence, self-satisfaction, worldly dominance, endurance, presence of mind, [and] knowledge of human nature”.Hermann was the fourth child of Jacob Kafka, a shochet or ritual slaughterer, and came to Prague from Osek, a Czech-speaking Jewish village near Písek in southern Bohemia. 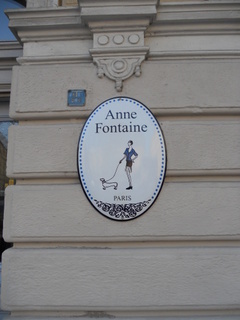 After working as a traveling sales representative, he established himself as an independent retailer of men’s and women’s fancy goods and accessories, employing up to 15 people and using a jackdaw (kavka in Czech) as his business logo. 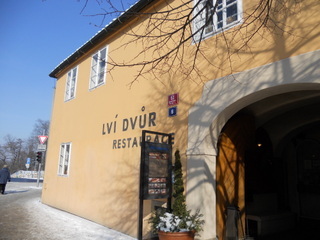 Kafka’s mother, Julie (1856–1934), was the daughter of Jakob Löwy, a prosperous brewer in Poděbrady, and was better educated than her husband. Franz was the eldest of six children.He had two younger brothers: Georg and Heinrich, who died at the ages of fifteen months and seven months, respectively, before Franz was seven; and three younger sisters, Gabriele (“Elli”) (1889–1944), Valerie (“Valli”) (1890–1944) and Ottilie (“Ottla”) (1892–1943). On business days, both parents were absent from the home. His mother helped to manage her husband’s business and worked in it as many as 12 hours a day. The children were largely reared by a series of governesses and servants. Kafka’s relationship with his father was severely troubled as explained in the Letter to His Father in which he complained of being profoundly affected by his father’s authoritarian and demanding character. During World War II, the Nazi Germans deported Kafka’s sisters with their families to the Łódź Ghetto and they died there or in extermination camps. Ottla was sent to the concentration camp at Theresienstadt and then on 7 October 1943 to the death camp at Auschwitz. Some sources have claimed that Kafka possessed a schizoid personality disorder– rather a rare type/trait according to some authors. His work, they claim, not only in The Metamorphosis, but in various other writings, appear to show medium to low-level schizoid characteristics which explain much of his surprising work. However, a study of Kafka’s family and early life by psychoanalyst Alice Miller in her book Thou Shalt Not Be Aware offers a different angle on the sources of Kafka’s psychological anguish and his expression of his painful early life in his writings. 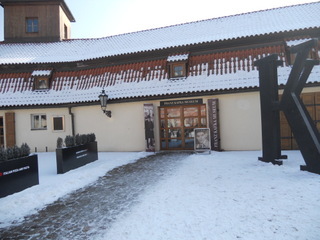 After visiting this museum the term Kafkaesque makes much more sense to me ..
Every person has their addiction. Mine is reading. I think I must have been reading as from the moment I could sit up. Reading is a second nature to me. Apart from tea I think books are the only thing I can’t live without. Voracious reader, I think, is the term. 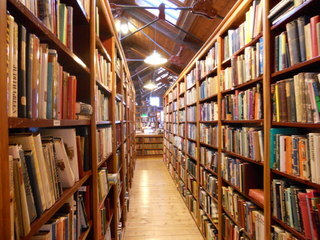 Not to say that I have a perfect memory, so nothing special there, but still books, and consequently book stores are to me like a casino to the gambler. Problem one might encounter in Prague would be the language barrier. So I wifi’ed English book stores and found two. 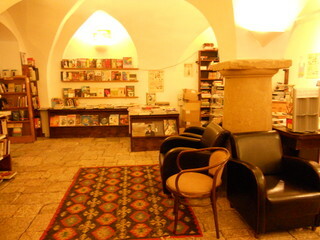 One we tumbled upon unexpectedly while staring at the entrance of a church was the Big Ben book store. 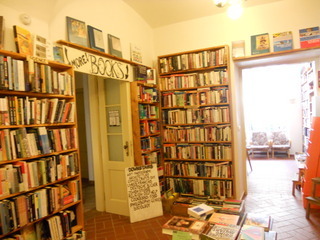 As you will find on below pictures this book shop is a delight. I’m a Woody Allen fan. 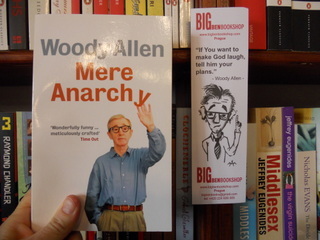 Not only I found a book of his, but Big Ben Bookshop also turned out to have a bookmark with a Woody oneliner on. upon this announcement board. Some czech stand-up comedian was announced. 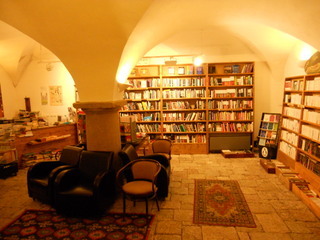 Was I satisfied with this one lovely bookstore? Are alcoholics ever satisfied with one pint of beer? So on we toddled and that in the direction of the Globe..
And joy of joys, the Globe turned out to have a tearoom as well. 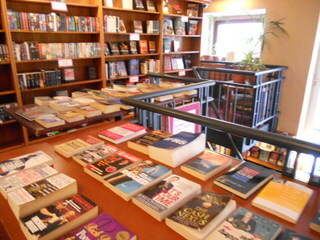 Entering the shop you will find the books, second hand books upstairs. At the back there is a café where you can eat as well. It was quite crowded with people in there and it seemed to us they were meeting up for happy hour. The sales lady was a friendly girl who happened to speak English quite well. 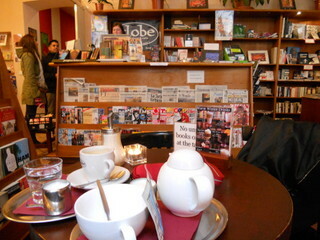 She said we could order our tea in the bookshop, advice we most readily followed. a second hand copy myself. And lo and behold, in the second hand section of the Globe, neatly displayed for me to grab a hold off I found the copy of Ask and it is given. The name says it all, n’est-ce pas? After a very nice intermezzo at the Globe we continued our wandering in the city. 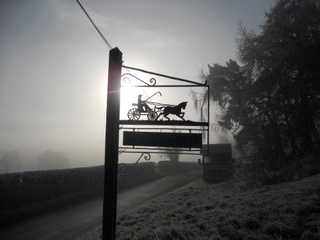 This idyllic shop we encountered and I was enraptured by the simplicity of the enamel signpost. 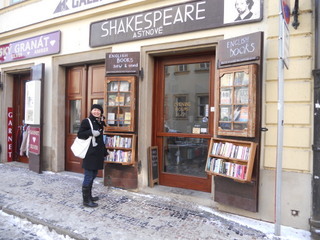 Besides it featured the picture of my all time favourite dog: a teckel..
And on our way to the Kafka museum we totally unexpectedly tumbled upon yet another English Bookshop called Shakespeare. Oh reader, such a delight, the Shakespeare is a shop in which you easily think yourself to have been transported directly to Britain itself. 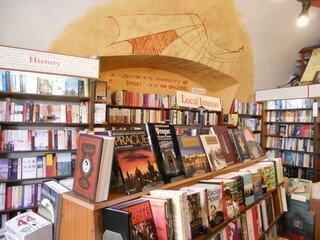 It’s an English language book readers paradise. 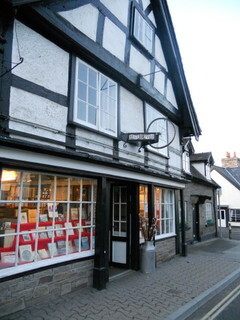 Please look at the pics below and marvel at the sheer splendour of nooks and cranny’s of this shop. 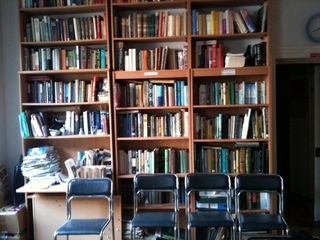 Easy chairs galore and books, books and books.. 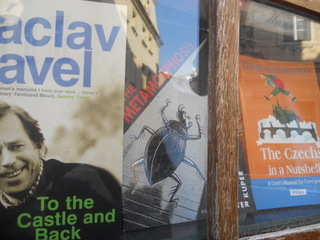 In the shop window an English version of ‘Die Verwandlung’, the Change, by Kafka. Gloomy story I read in highschool and which I never forgot for the sheer pessimism and loneliness portrayed in this story. I remember I wondered at the person who had written this book. Where would one get such horrid fantasies from. 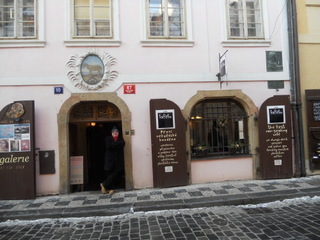 The Kafka museum we were to visit later was going to answer that question. But I am ahead of myself. Please take a look at the Shakespeare and enjoy! 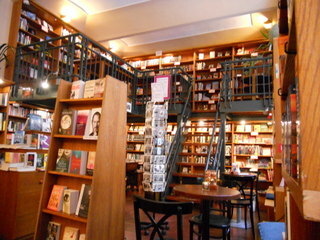 The bookshop was a delight. 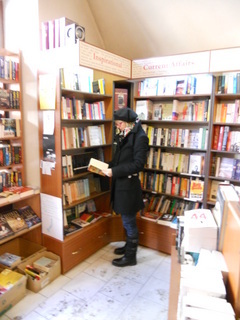 Easy to spend hours and hours leafing through books on all kinds of topics, art, biographies, novels, you name it, this bookshop had it. I even found a new book with work of my all time favourite artist (cartoonist for the New Yorker and all) Sempé. 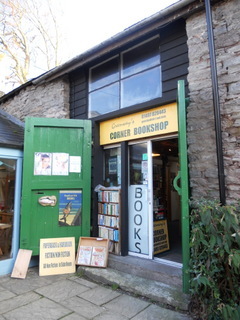 Unfortunately the books were rather pricey so we came away out of this shop empty handed, but I must admit this was due to the fact that the sales person was chatting with another customer and was so lengthy that we gave up and left. Of course we had no clue what the conversation was about, but we did not want to wait any longer. 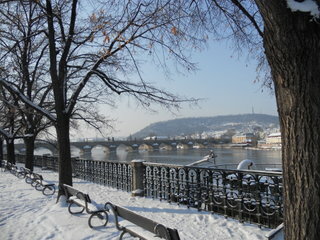 Ah those impatient people from Western Europe..
Never really seriously considered going to Prague (Praha). Of course I’d heard about it. Actually heard real promising things. That it was supposed to be really beautiful. 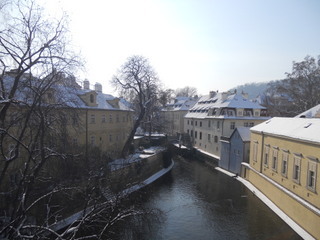 Anyway, I got invited to go to this city in the Czech Republic and went. The weekend of 11th of february to be precise. We flew in from Amsterdam on an evening flight thus arriving in Praque by night. A taxi was waiting for us at the airport. 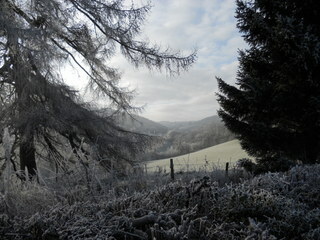 Good job too as it was freezing. LIterally I mean, it was minus fifteen. The taxi ride through a seemingly deserted city was promising as well. 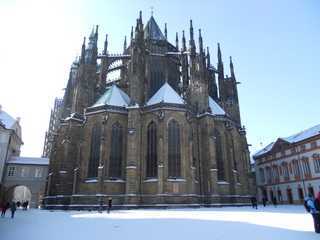 Since it was snowing vigourously, the taxi could not speed and the city looked rather fairy tale like, what with the snow, the friendly street lanterns and the beautiful buildings. The mere sight of this gave me a hunch saying this weekend was going to be a real treat. 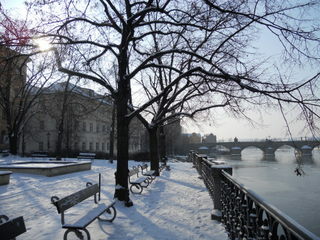 Another surprising fact: non-smoking policy had not yet reached Prague. So in every bar, restaurant, café, smoking was allowed. Fortunately we found some modern places where smoking was not on. 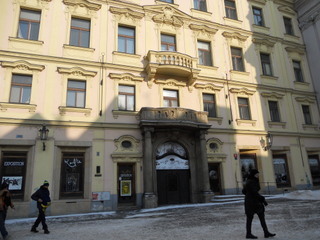 The hotel was in a street next to the Narodni Museum (National Museum of paleontology and mineralogy etc) which is at the end off the Wencelas Square. Although a tube station is in front of the museum we preferred walking. I must admit I had to cover my face with my shawl in order not to have my nose freeze off at times even though the blue sky was spotless. 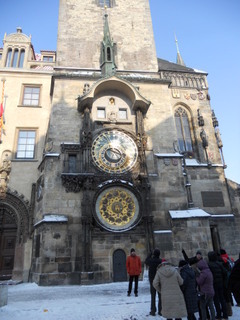 So we walked over to the Old Town square to find the Astronomical Clock. 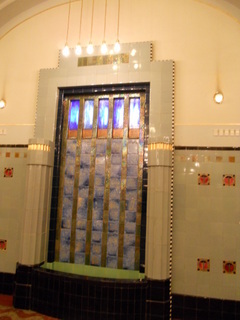 Although a nice piece of craftmanship, I was not too interested in it. 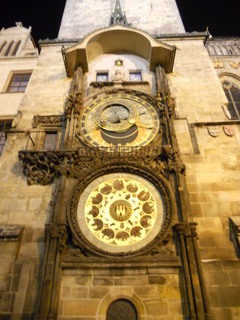 I’d seen a nice clock in Paris as well, so I was more interested in the square itself and the buildings surrounding it. It looked charming to me. 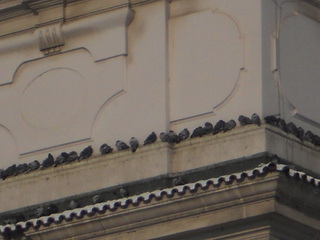 As a bit of a flora and fauna fan I immediately spotted a row of pigeons sitting closely together in the sun on the St Nicolas church. 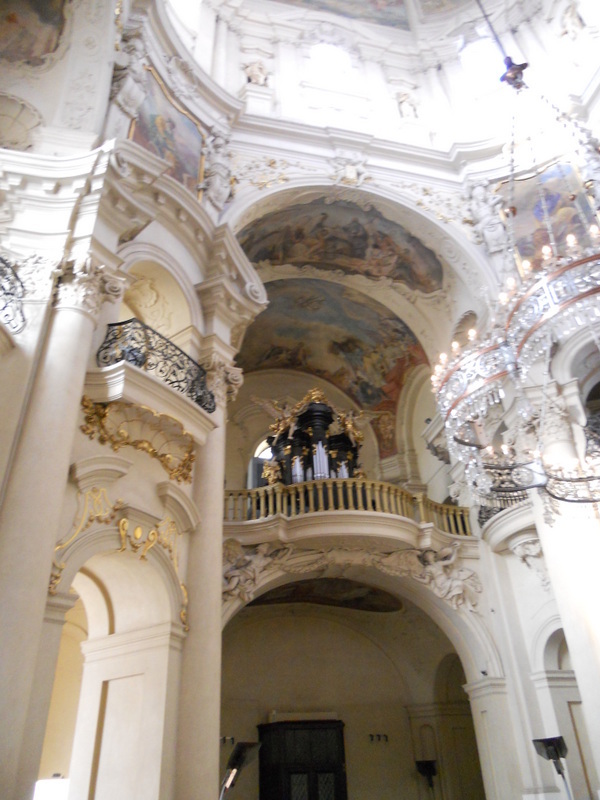 This church was the first we entered and it was amazing. 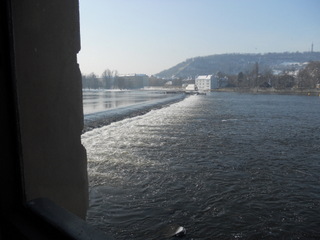 Unfortunately pictures are nothing compared to the real thing but here goes..
We walked to the river. Splendid sight. We were so very lucky to have this wonderful sunshine. 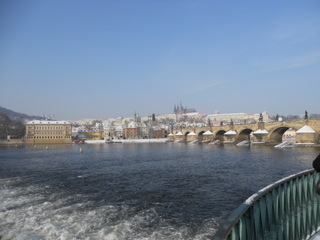 Then we passed the Charles bridge which we would cross after visiting the museum. The museum is but a block away from the bridge. 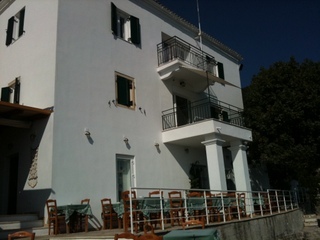 It’s very happily situated overlooking the water. 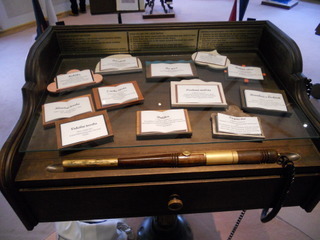 The conductors stand with examples of Smetana’s music. Just pick up the baton and point it at one of the chosen music pieces and the orchestra plays at your command.. The Lafka is the café nextdoor. We asked to sit near the window overlooking the river. With a hot chocolate and the view we were quite content. 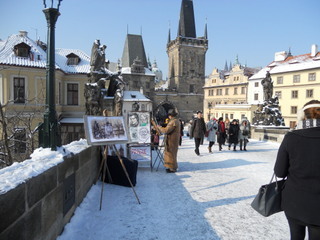 We continued our route and walked back to the Charles bridge. Since it was friday and february there were surprisingly few tourists about. Everywhere you look, you find something beautiful, both the statues on the bridge and the views from the bridge are picturesque and lovely. The wonderful state of the buildings creates a sensation of being somewhere where graffiti and ugliness have not yet darkened the aspect of the city. Such a surprise. It gave me a feeling of having set foot in a place where beauty is revered and where time has nearly stood still. 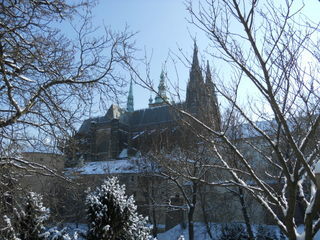 Prague castle taken from the left side. Quite the fairy tale castle.. 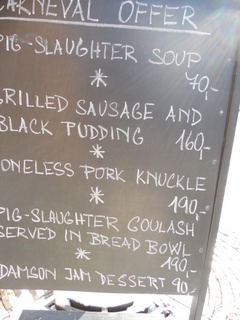 Pig slaughter soup and Pig slaughter goulash… all but appealing for a vegetarian.. Walking back to the bridge we passed the oldest vineyard overlooking Prague. We were starting to get a little peckish. A colleague of my friend had advised him not to eat in the places directly on the squares but rather look into restaurants a few streets off the main squares. Better value for money and nicer food, or so he said. 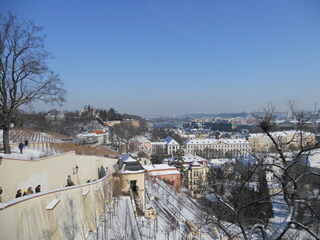 So we walked up a street behind old town square. 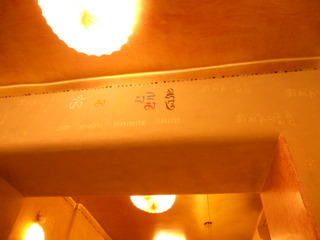 We could not really find the restaurant recommended to us, but I noticed a sign saying ‘Maitraya’. My attention was drawn and I proposed we try this restaurant. Oh and what a good choice that was! 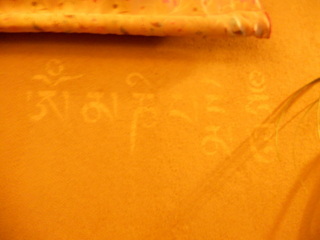 Not only it turned out to be a vegetarian restaurant but it had the Tibetan Mantra Om Mane Padme Hum painted delicately on the walls and it simply turned out to be a wonderful find.. 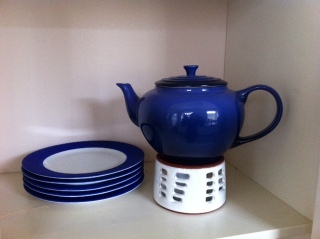 Besides, the tea came in a soupbowl and the food was simply delcious. I had the loveliest selection of salads and as you can see on this picture indulged in a fantastic lemon pie with cream… YUMMY! 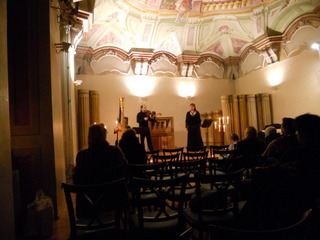 In the evening we went to a concert that took place in a monastery. It was a modest concert with 4 musicians (harp, harmonium, violin, alt voice) but it was well played and we rested while enjoying the performance. When the harp played ma vlaste by Smetana in a smashing solo performance I felt really happy. I think this melody is so beautiful.. There weren’t very many in the audience, and those present were tourists, but still it was a nice concert so I wondered at the fatigued faces of the performing musicians. 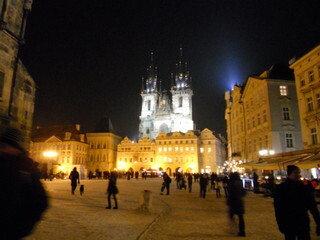 The old town square looks very nice by night as well. Then we called it a night. 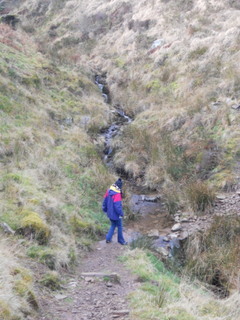 We walked back to the hotel, had a lovely bath and a nice cup of tea. 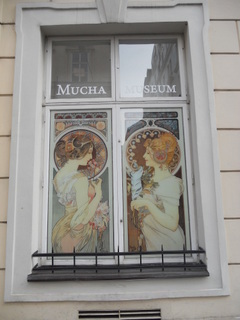 In the morning we set off to the Mucha museum. Alphonse Mucha is well known for his Art Nouveau posters. When you see them, you will probably think they look familiar. Nice posters. 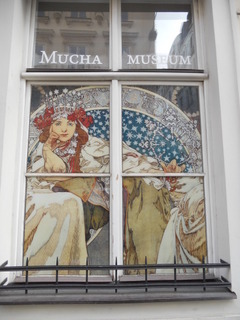 However, when you visit the Mucha museum, it will dawn upon you what an exquisite artist Mucha was. And such a prolific one. 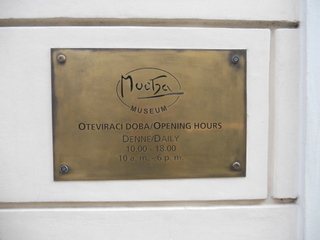 We were in awe of his work and I would recommend anyone to go to Prague if only to visit this museum. Unfortunately taking pictures inside the museum was prohibited. The above pics are of the outside. 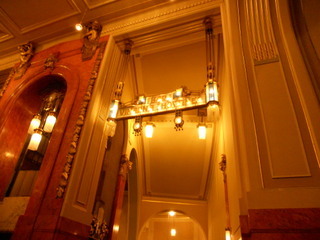 We went over to the theatre designed and decorated by Mucha. I took pictures both outside and inside. 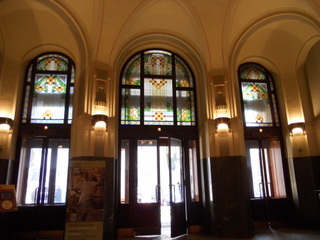 Pics below are street view and view from the inside of the facade. The grand café looked a marvellous place to have a tea, unfortunately we discovered in here that smoking in public places was still allowed in Prague. The only downer here. The tea was good and the lovely ‘chariot de desserts’ made ones mouth water..
Calories galore, but since we did everything on foot, we could indulge and not get overweight in the process.